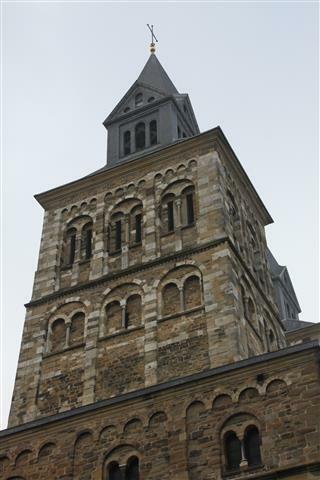 I’m leaving Saint Servatius in Maastricht and before I head away I want to post more photographs of this beautiful building . 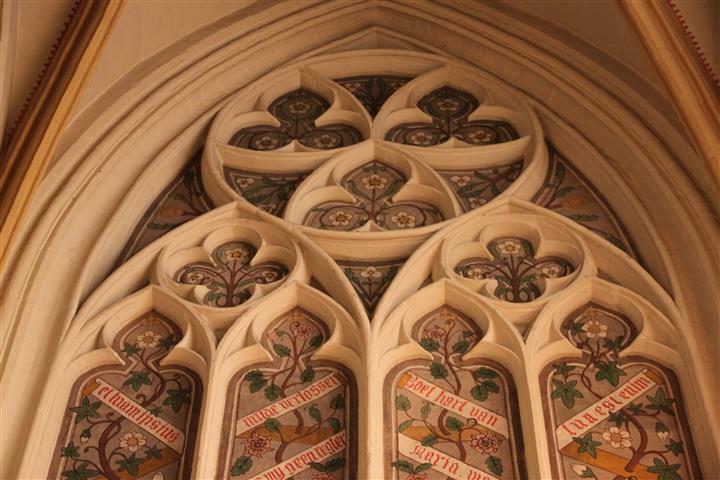 The detail delights me, the textures, patterns, carvings and the history in every stone inspire me. 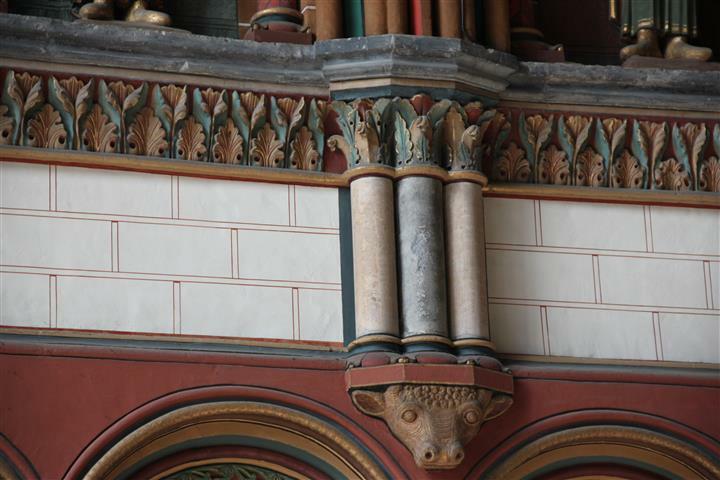 If you are a lover of historic architecture like I am, then I’m certain that you will be delighted too…. 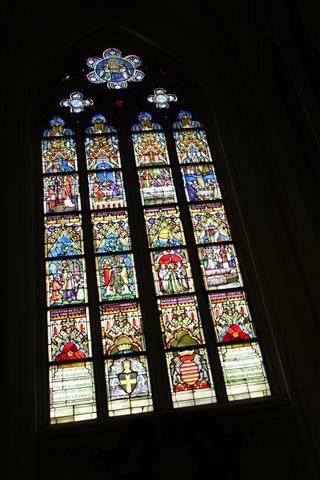 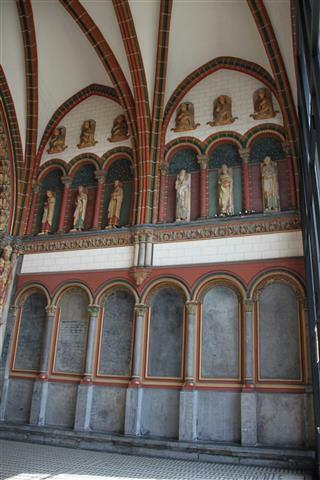 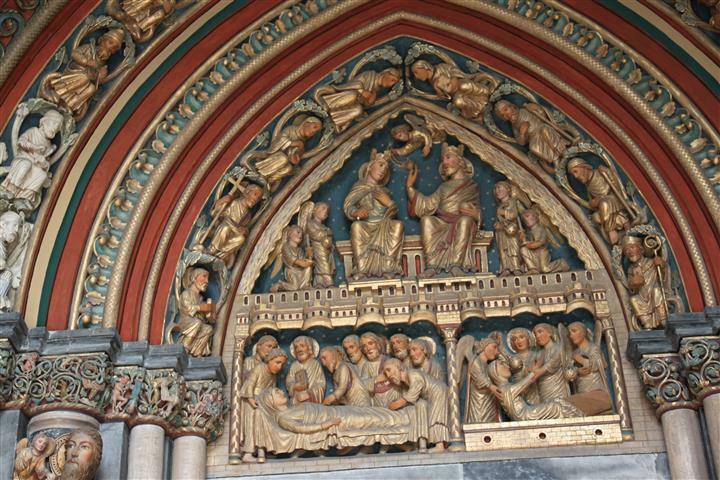 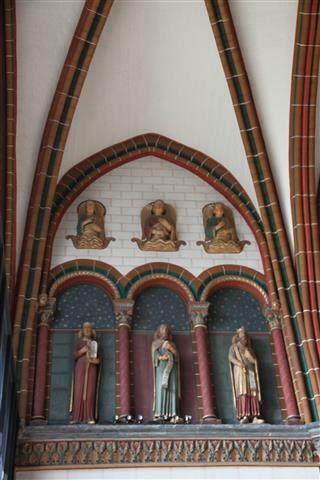 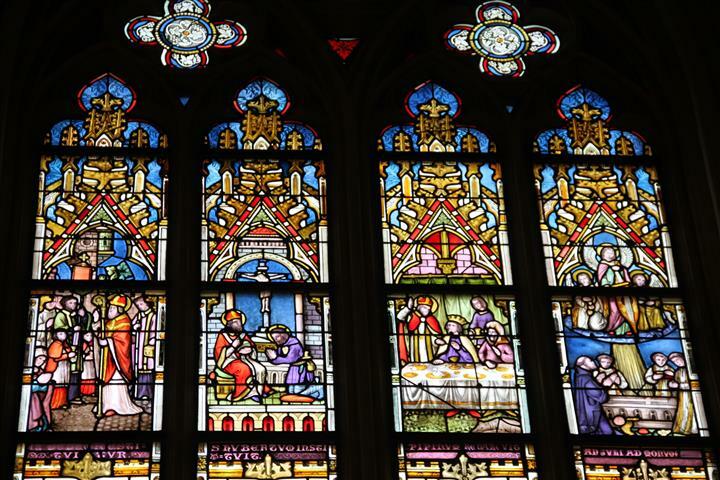 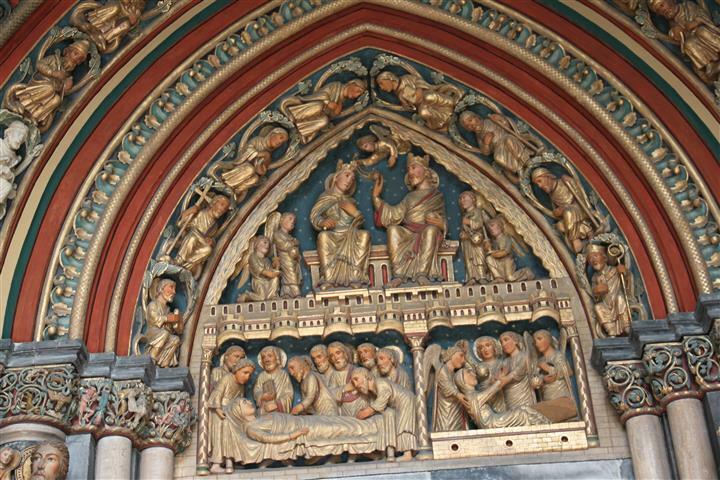 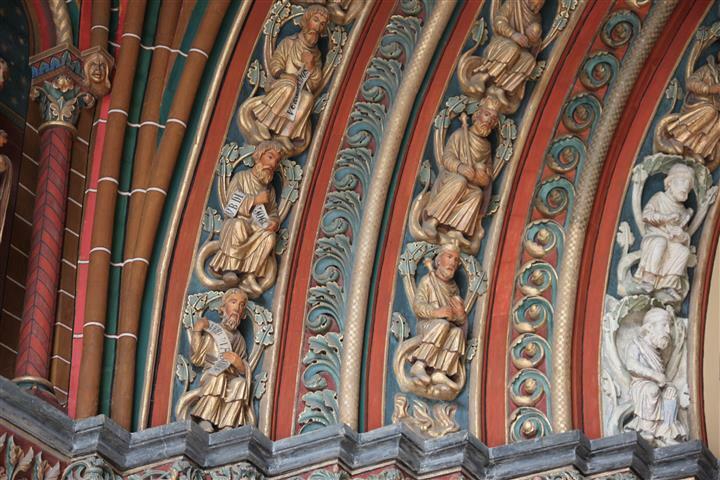 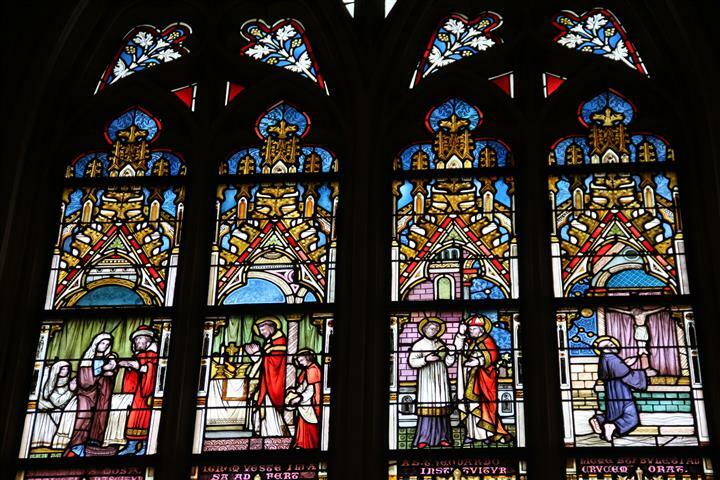 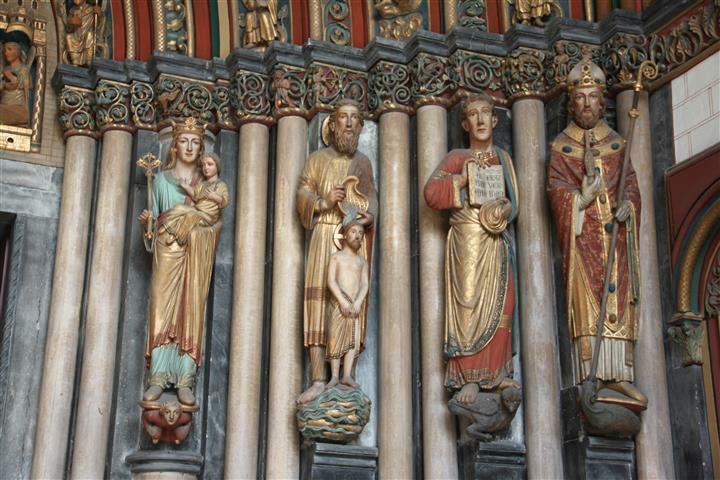 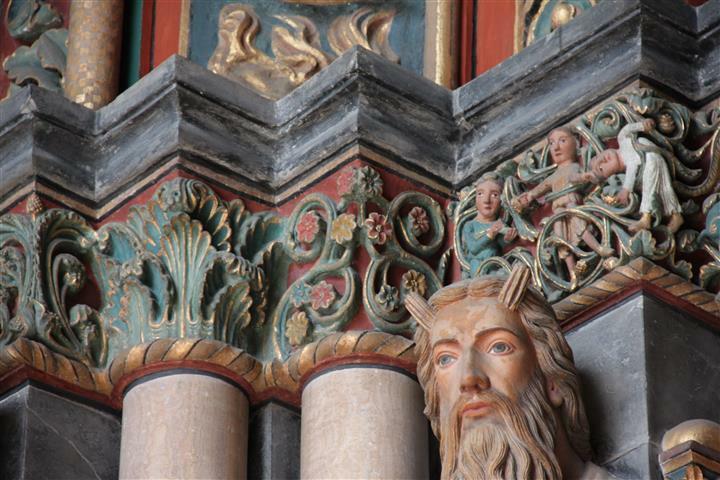 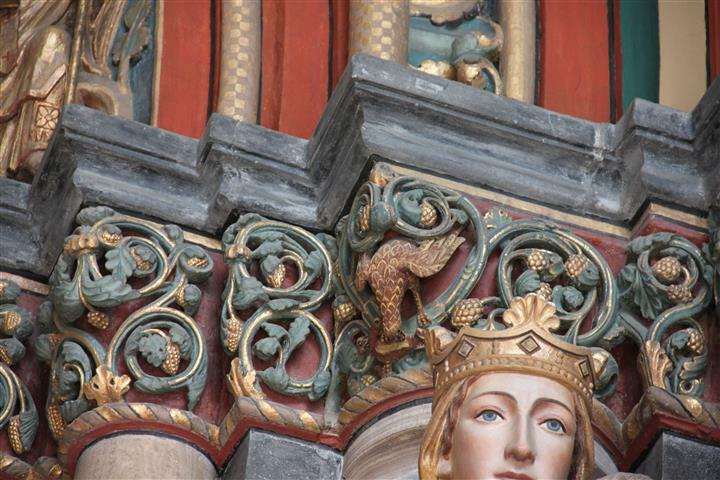 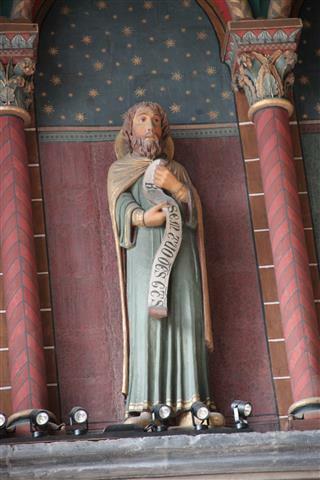 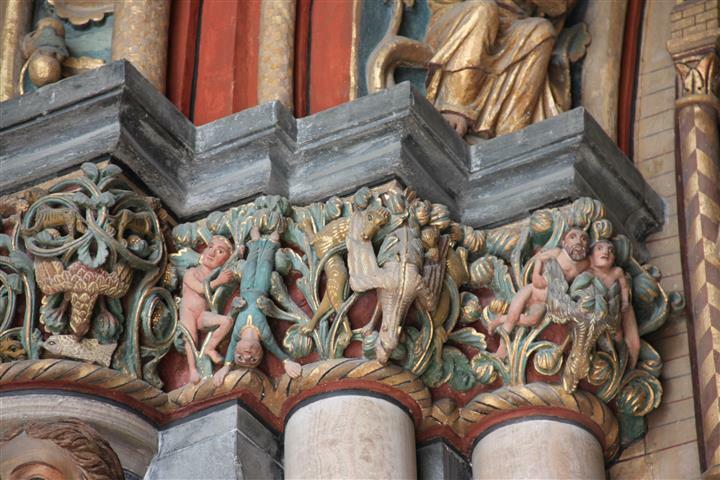 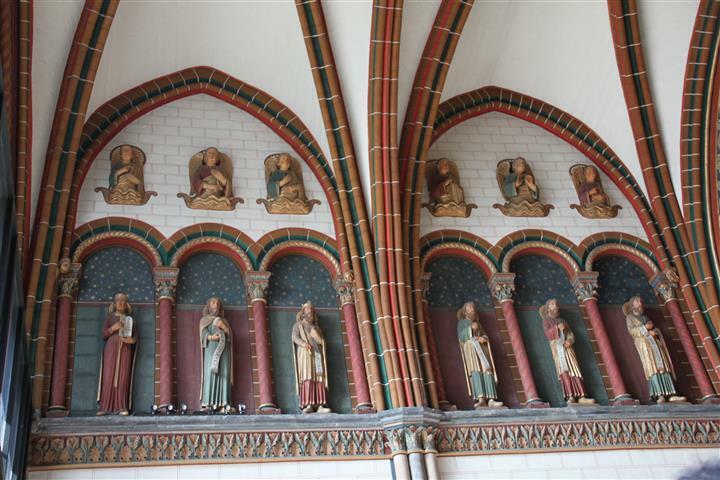 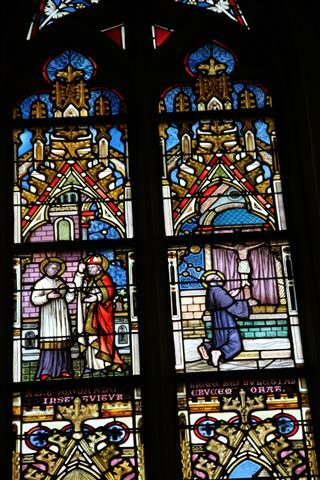 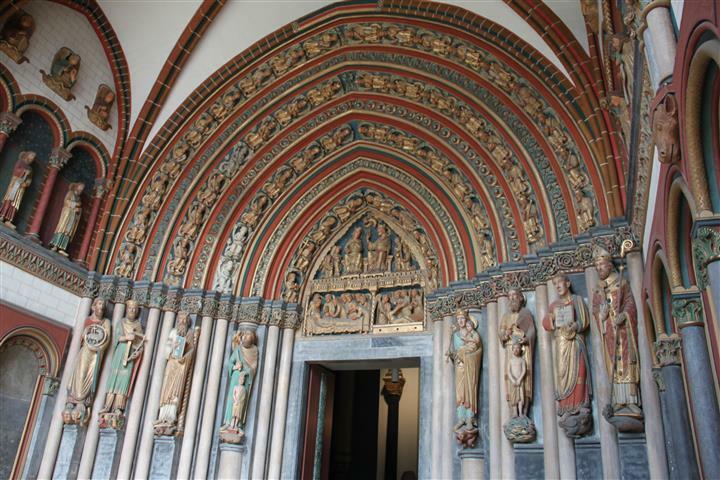 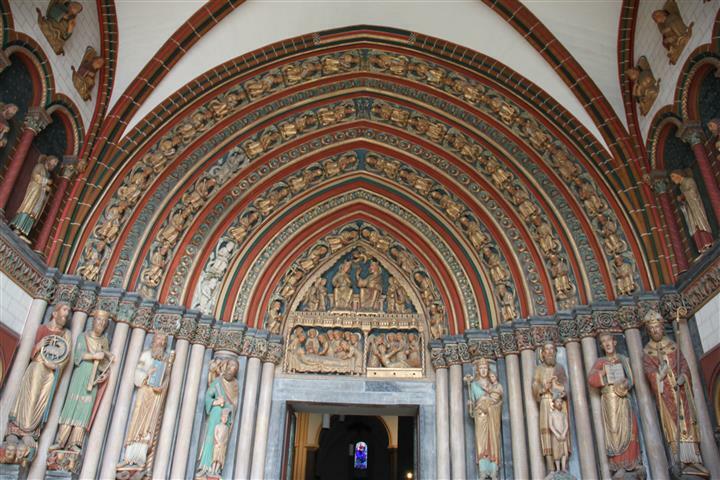 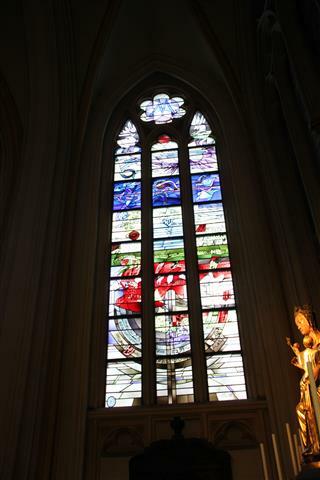 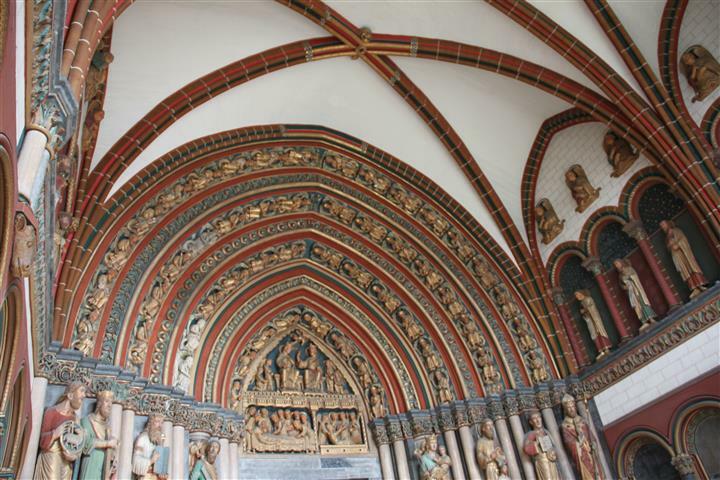 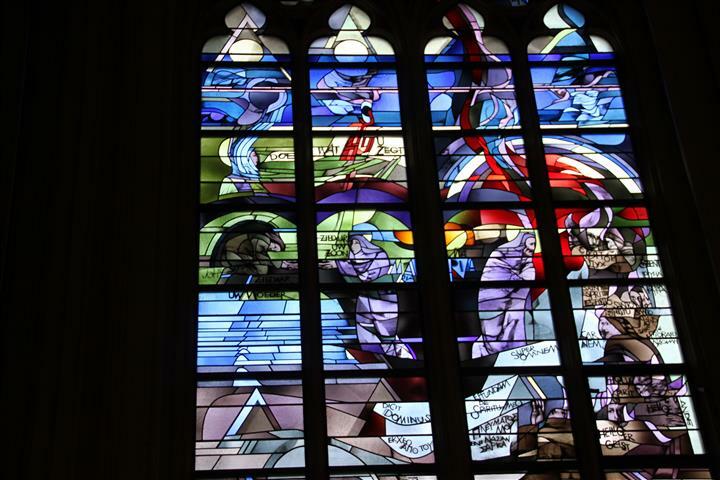 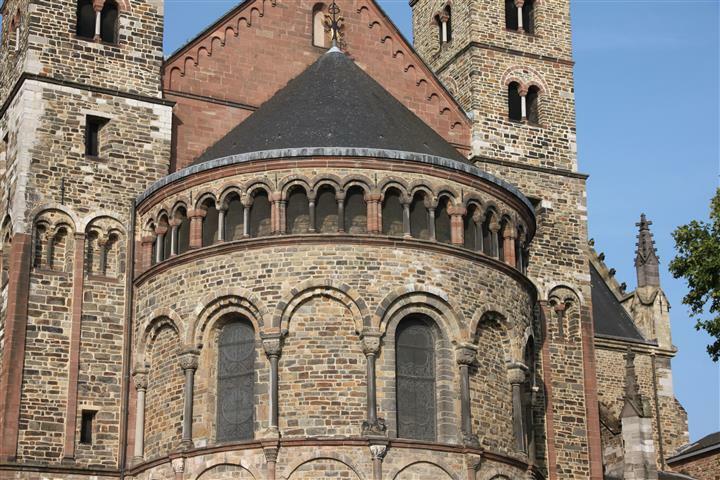 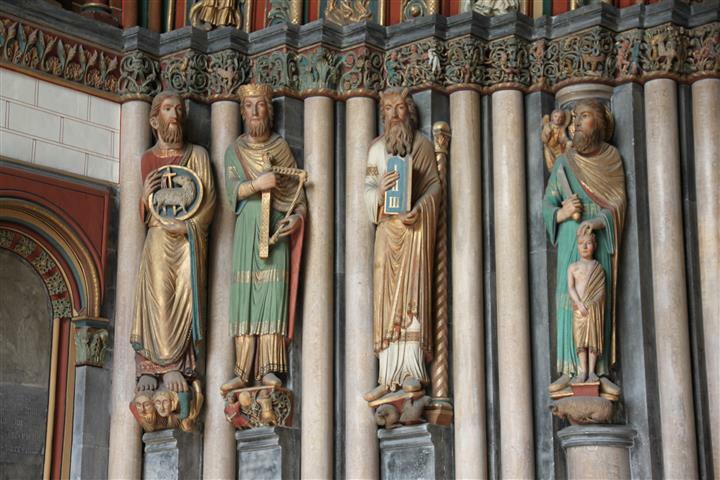 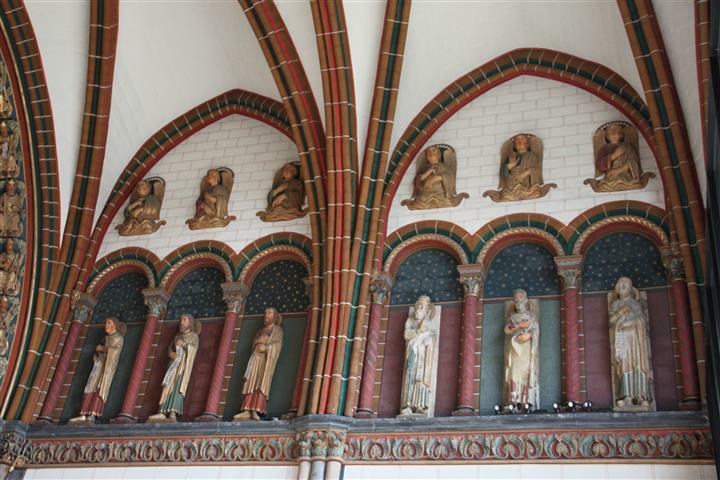 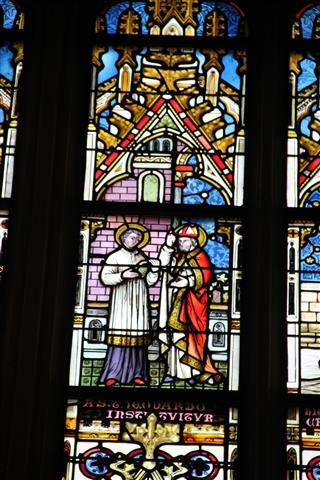 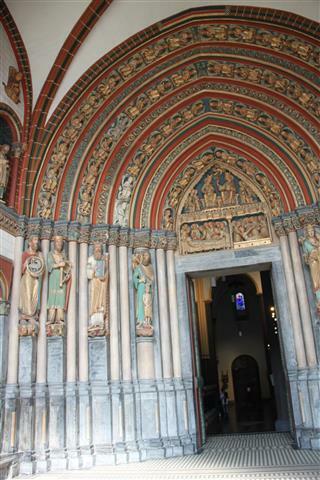 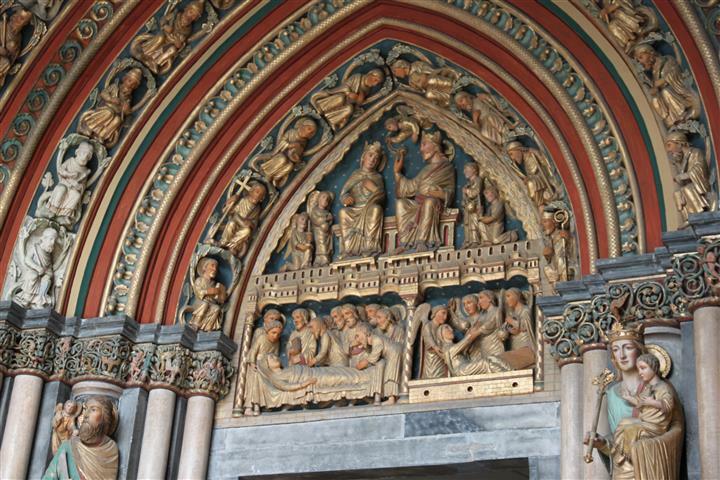 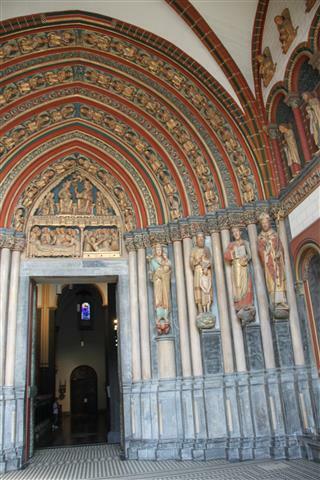 The interior of the Basilica of Saint Servatius is an art-lover’s paradise. 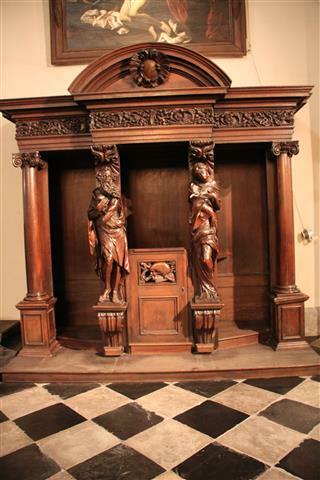 One of the things that captures my eye are the large number of confessionals around the church. 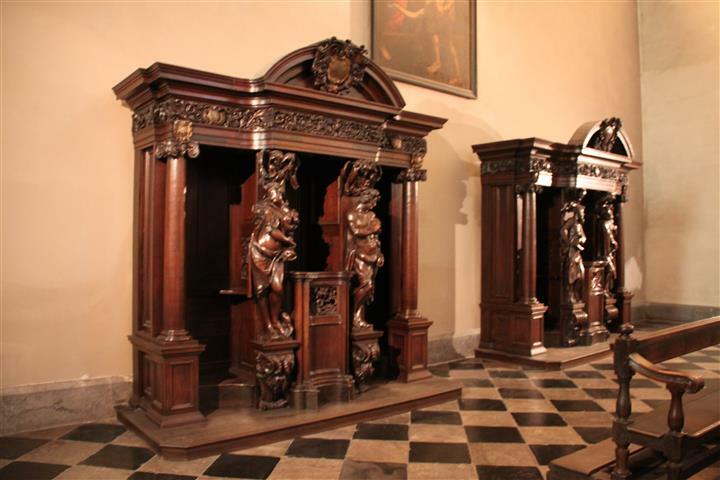 Not just any confessionals either: these are massive pieces of furniture, each of them has a sitting area for the priest in the center and then a cubicle to the left and the right that contains a small seat and a screen separating if from the priest’s seat. 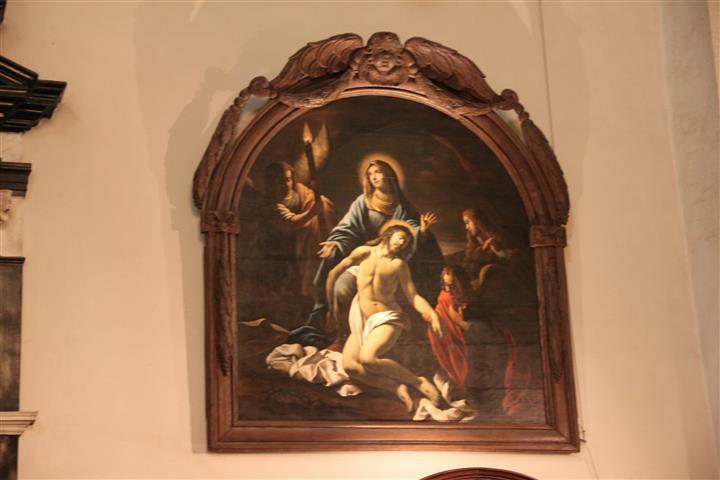 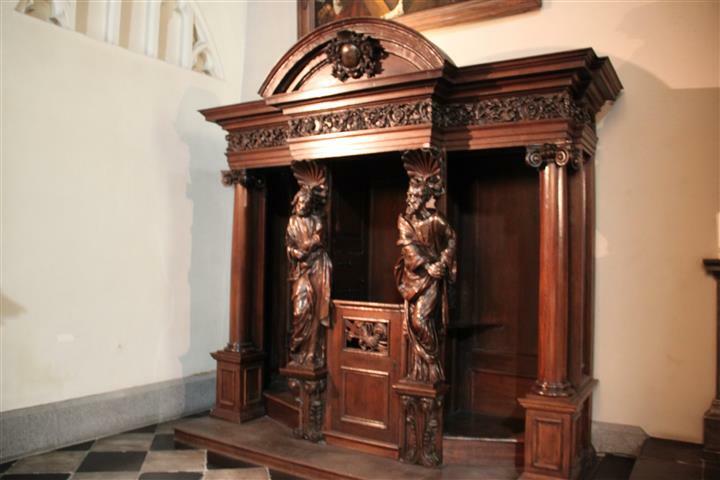 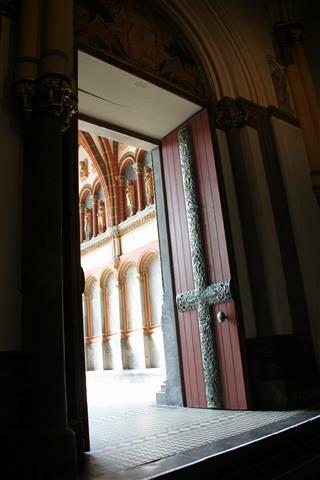 The confessionals are located in pairs throughout the Basilica and so in theory at least eight or twelve confessions could be heard in quick succession by three or four priests. 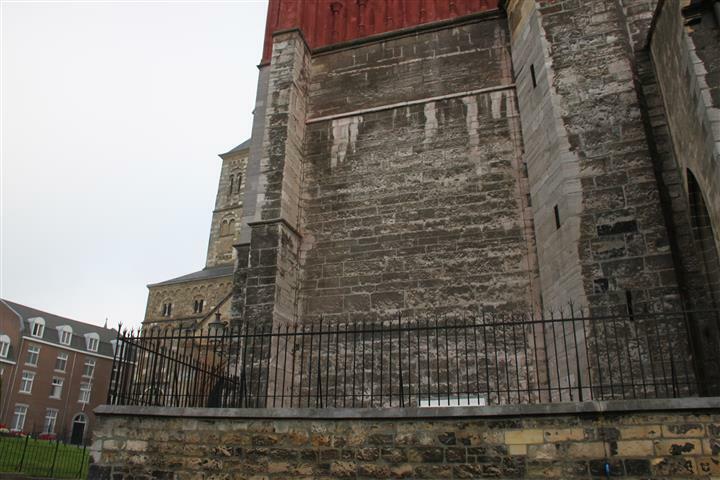 They are more than two meters high and at least four meters long but are dwarfed by the huge spaces in which they stand. 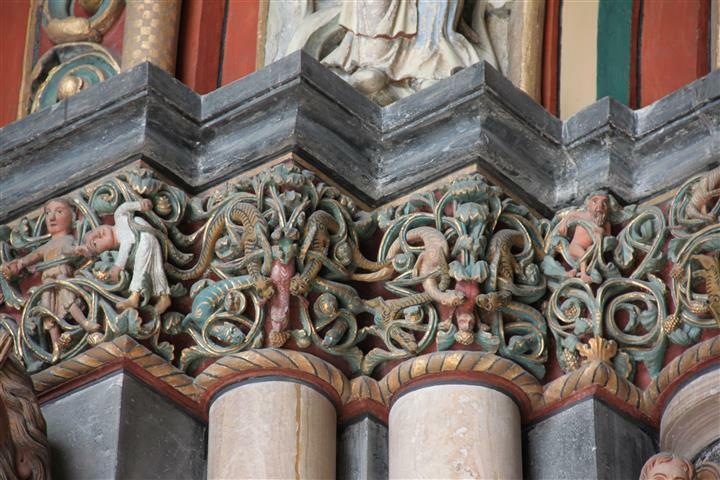 I confess I love these too because they are decorated with ornate carved statues and are great examples of all aspects of the woodcarvers craft. 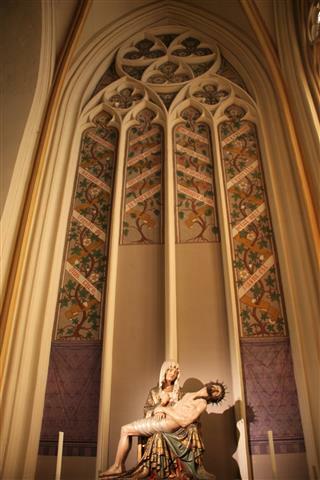 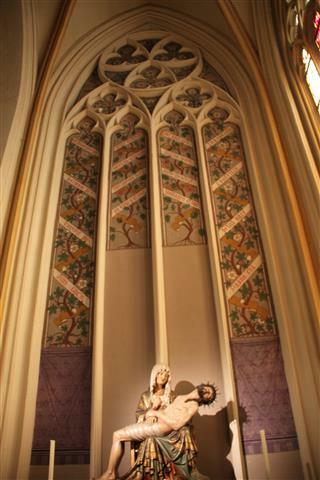 It also proves that even the most functional pieces of furniture in the Basilica have been crafted with care and detail.People took pride in their work and valued beauty, something that I think has been almost completely lost when it comes to public and community spaces in the 21st century. 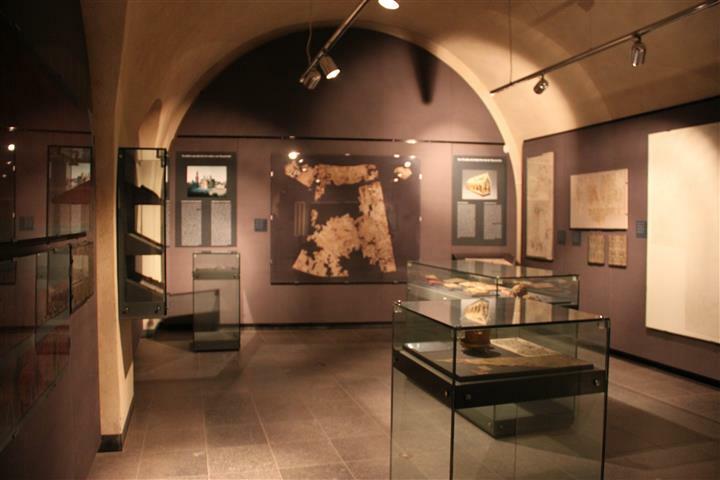 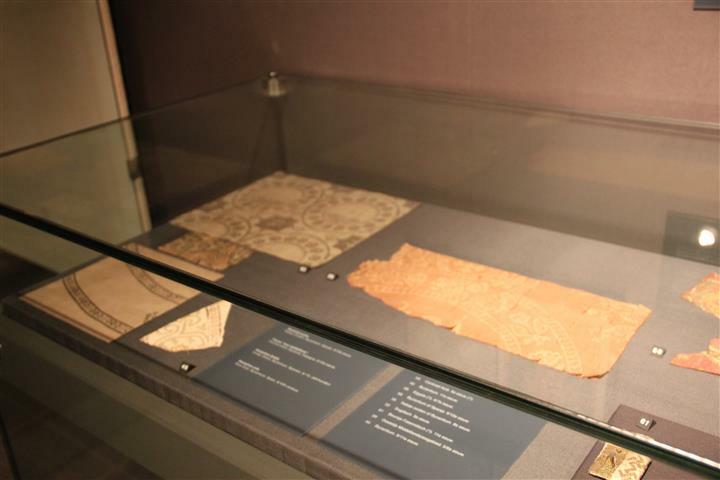 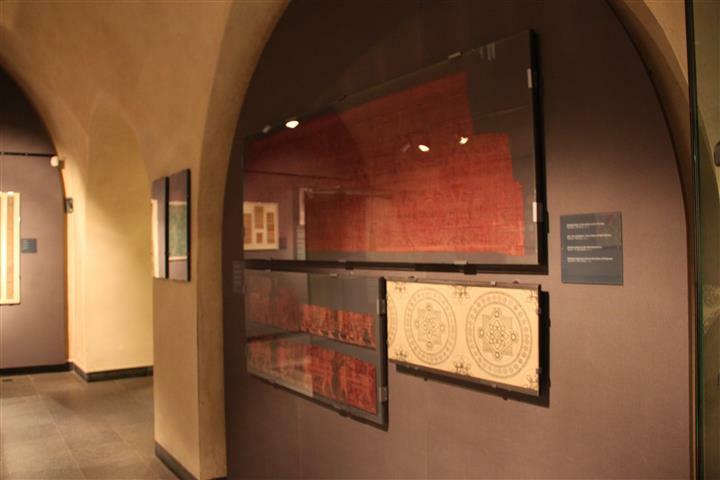 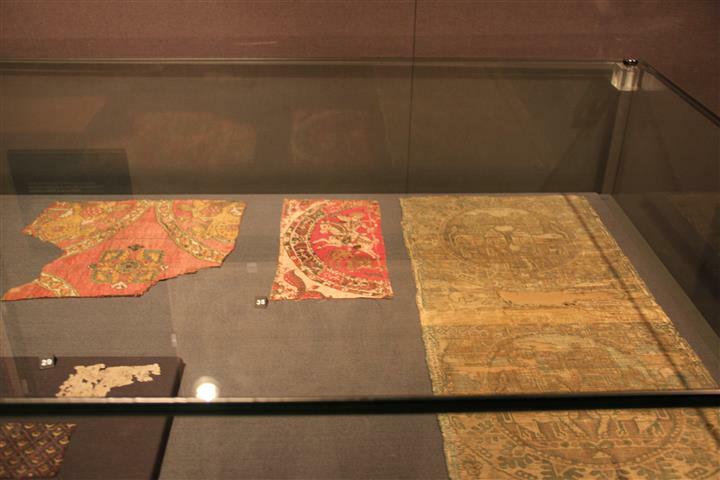 Whilst visiting the Basilica of Saint Servatius in Maastricht several years ago I was delighted to find an exhibition of textiles in a room, fittingly located next to the room where the gold, silver, ivory were displayed. 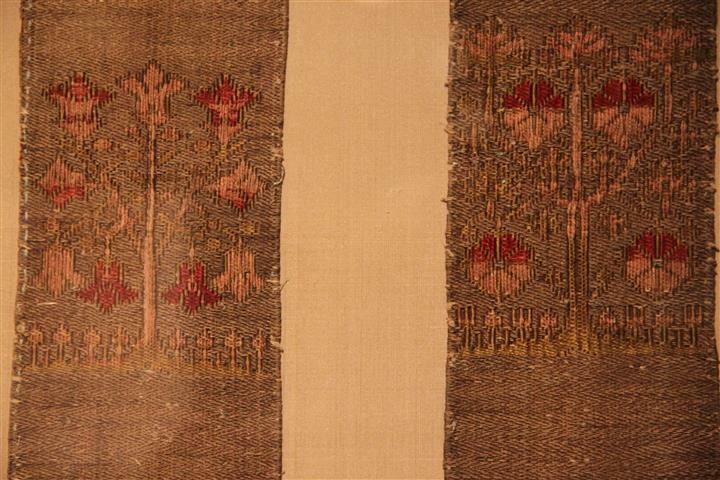 I have been an avid embroiderer for many years, but my passion for stitching has been put on hold since my accident because high doses of pain medication have effected my concentration levels to the point that I was unpicking more than I stitched. 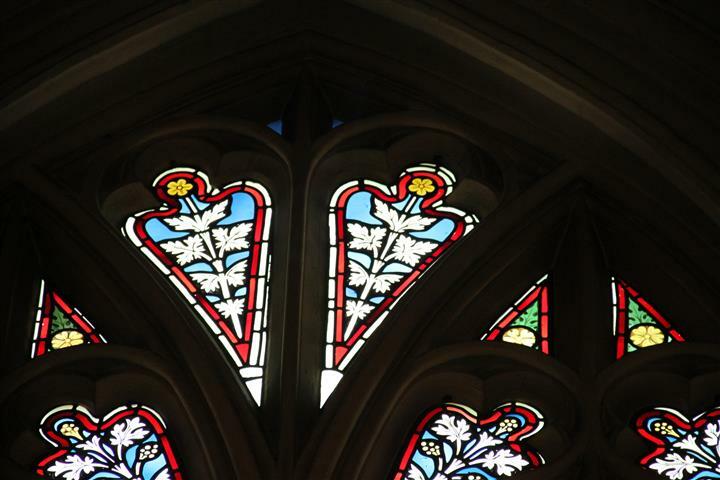 Various drugs such as Prednison, used to control my chemical lung damage and asthma have also affected my eyesight and I find it increasingly difficult to see tiny stitches that I had no trouble with just five or six years ago. 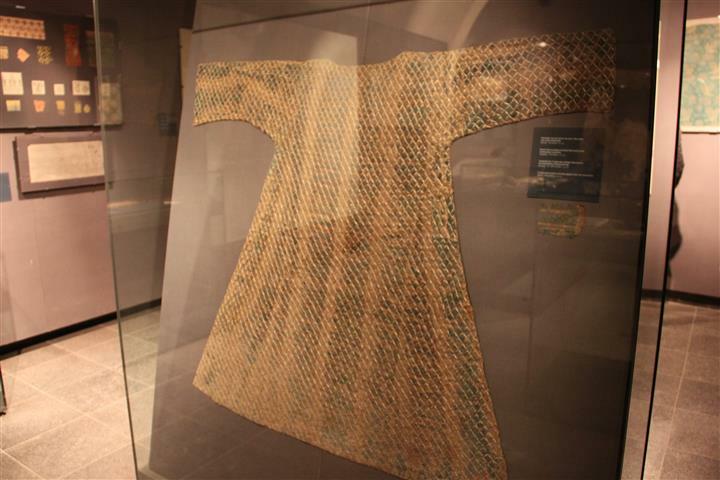 Even if I am not currently stitching, I still love the pattern, texture and feeling of all things fiber and this, blended with my love of history means that an exhibition like this makes my heart sing. 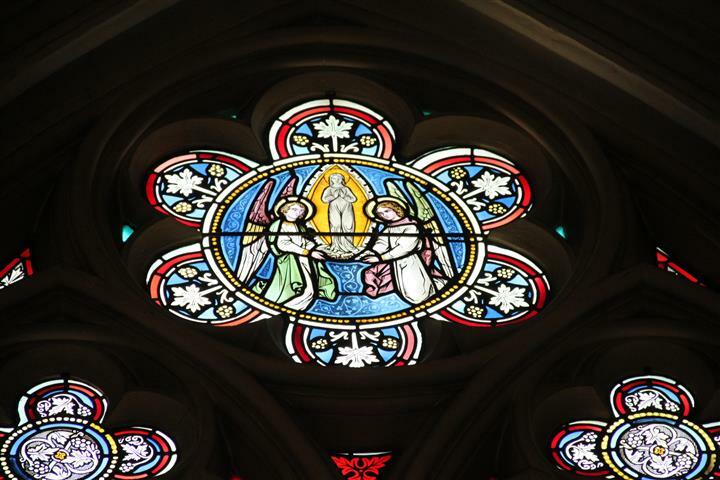 “From the beginning of Christianity, articles belonging to a beloved and respected person have played an important role, the owner of these articles could depend on the special protection of the concerning Saint. 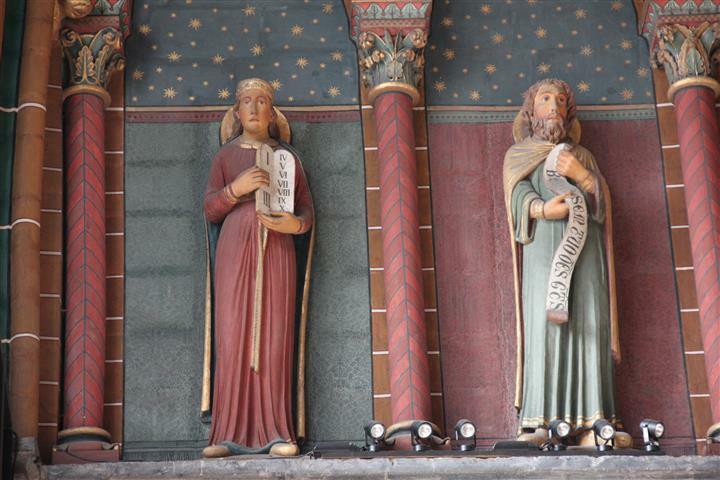 In the default of relics, people proceeded to consider articles as a relic, which had a close relation with the Saint. 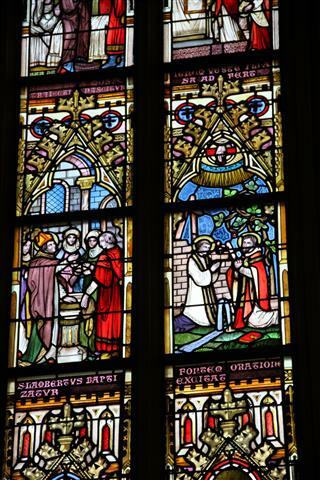 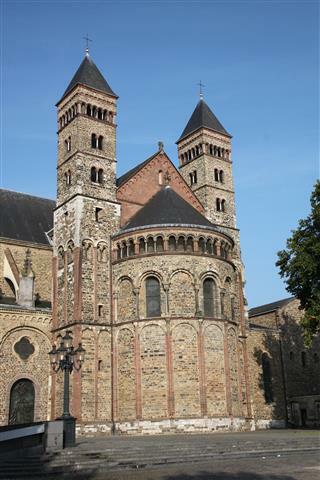 That also goes for the objects and the art-treasures which are in the treasury which have belonged by tradition to Saint Servaas (+ 384 A.D.), the fist bischop of Maastricht and of the Netherlands: the cup, the key, the pectoral cross, the seal, the altar, the travelling chalice and the paten, the crosier and the pilgrim’s staff. 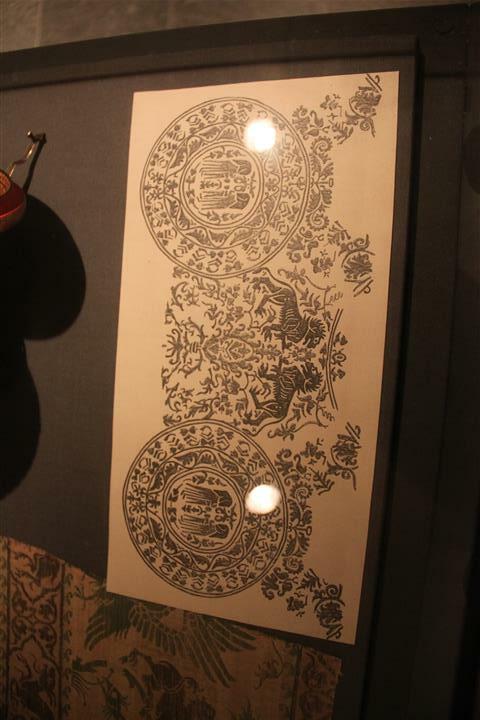 It was owing to the great veneration of Saint Servaas that important documents concerning textile and needle art have been preserved for us. 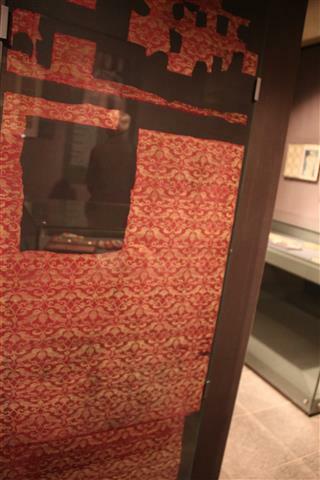 Like this, the so called “bandea” developed in the old christian times: linen or silk sheets which were draped over the grave or over the reliquary-shrine. 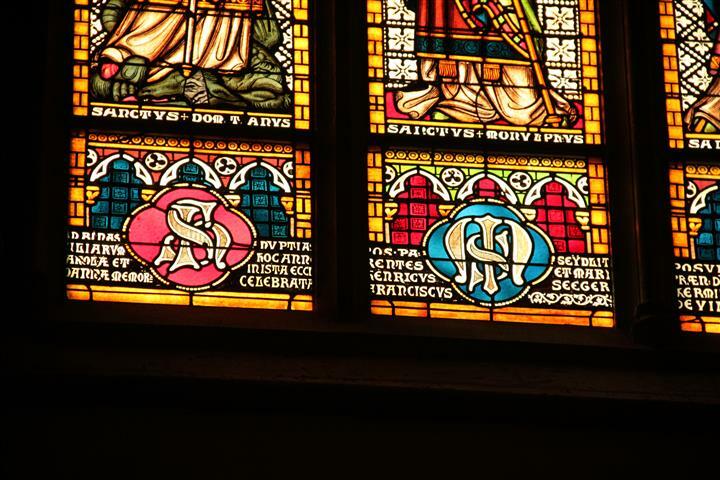 By that these sheets became sanctifying, and for the future, honoured as a relic. 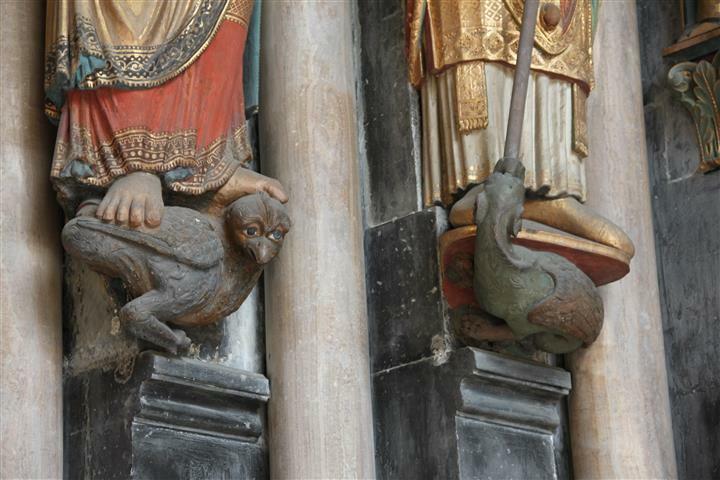 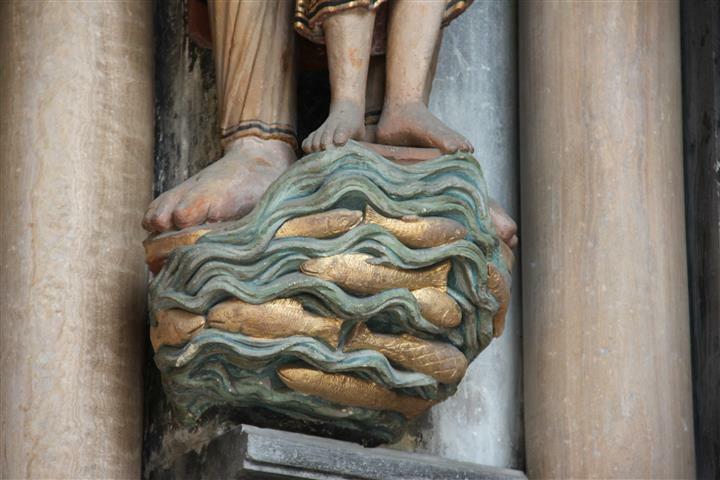 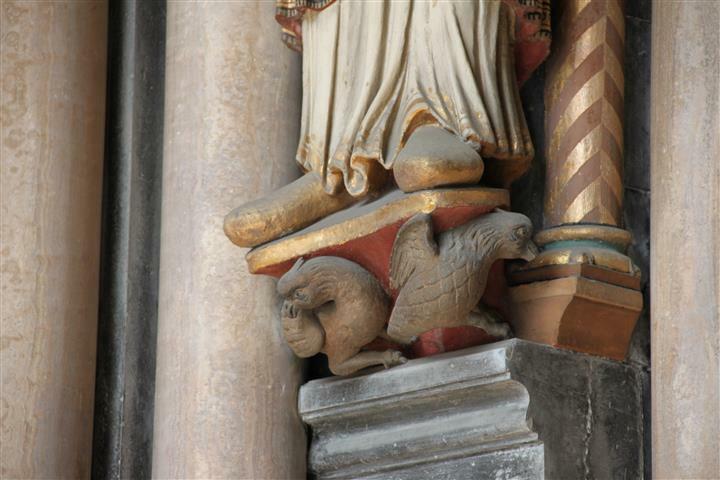 The numberous textures in which the relics were wrapped in, became also part of these relics. 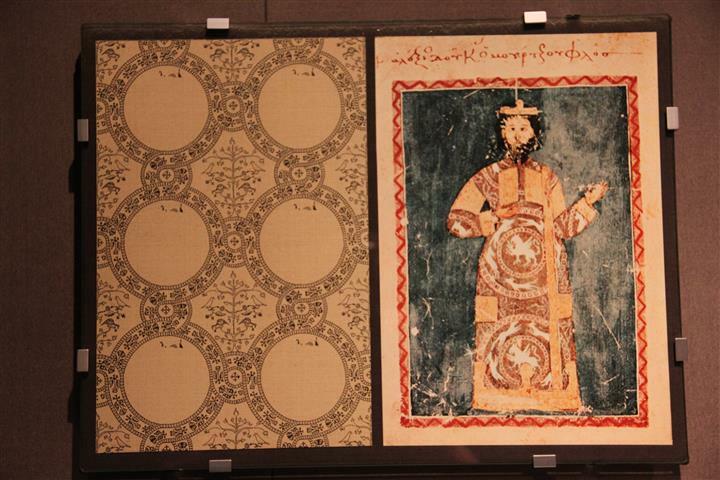 From the earliest christian times, these, often very small packets, received a certificate of authenticity: aparchment slip (cedula) with the name of the saint. 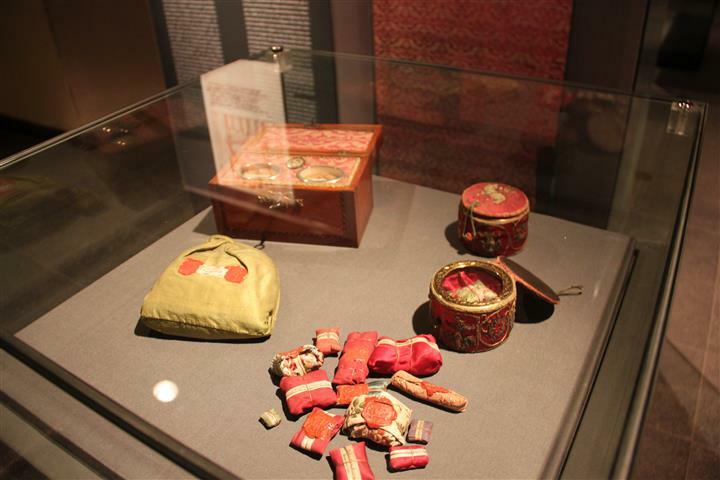 This packet was put away in an alter or in a reliquary. 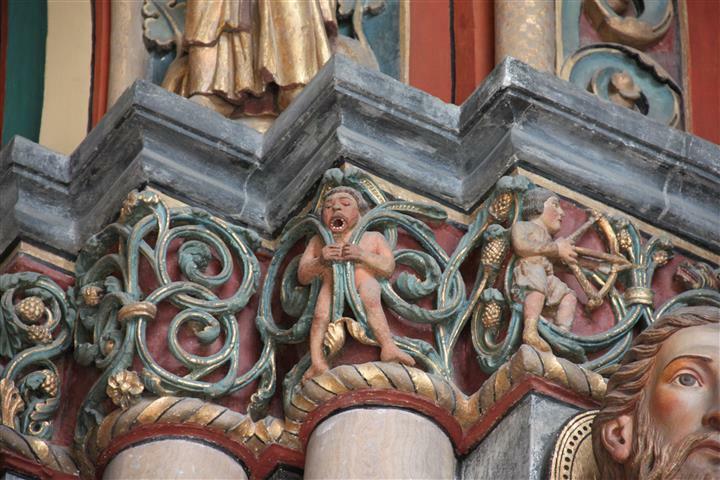 This tradition has been maintained up to now. 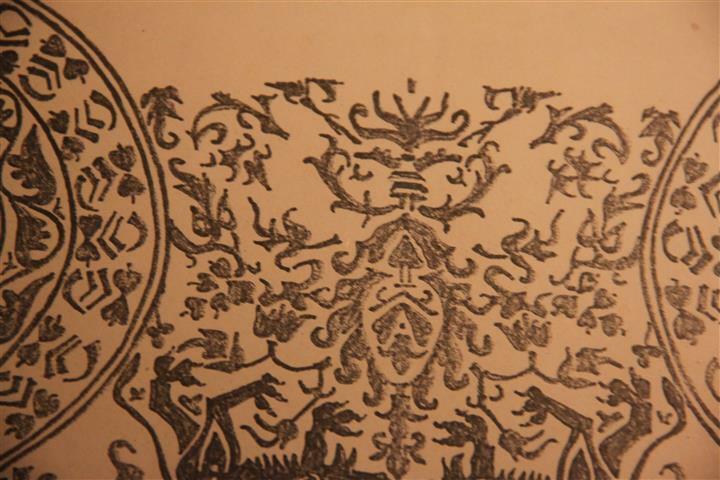 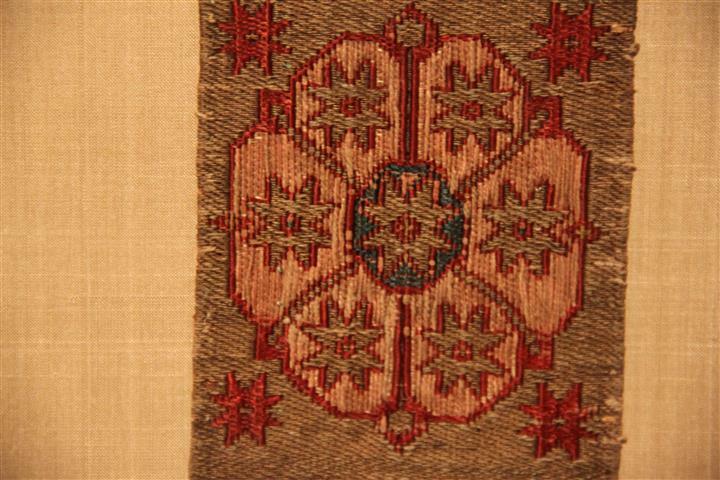 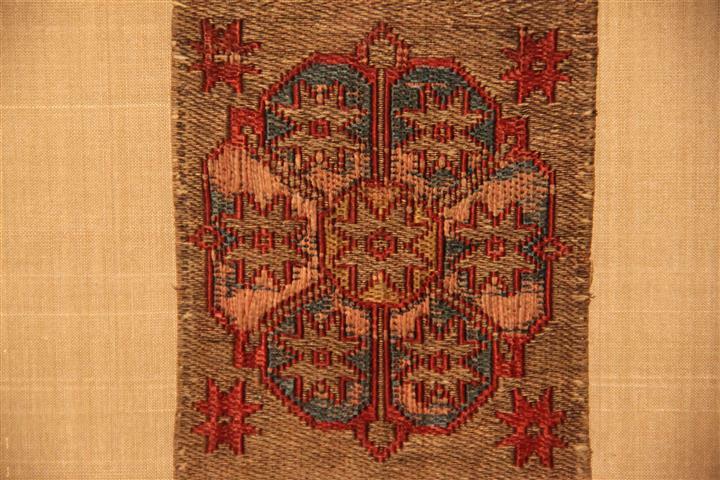 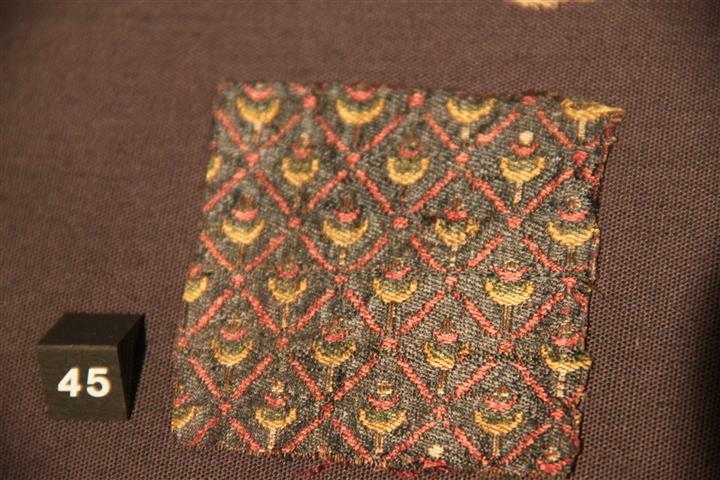 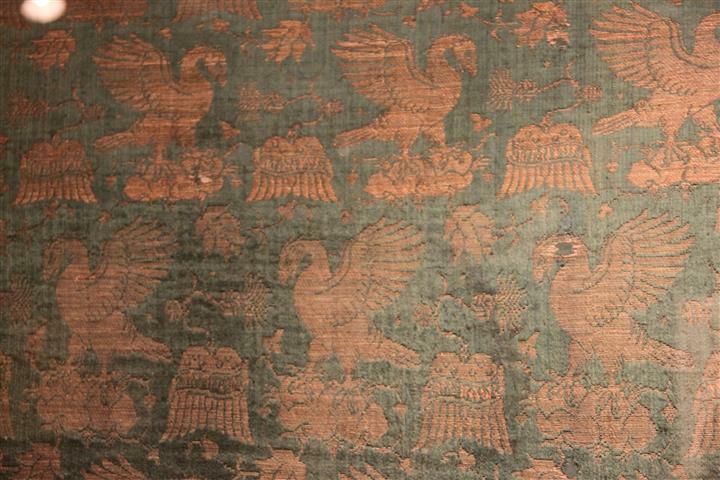 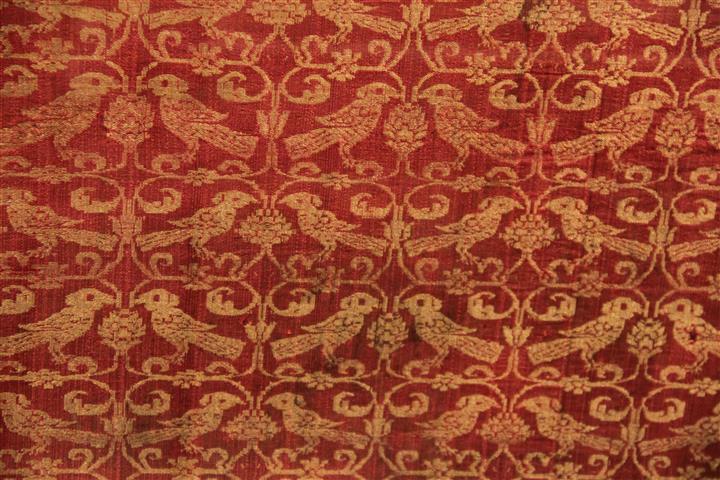 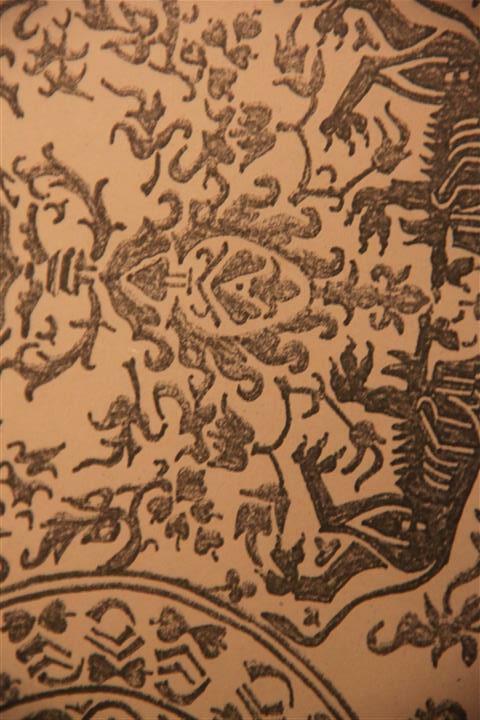 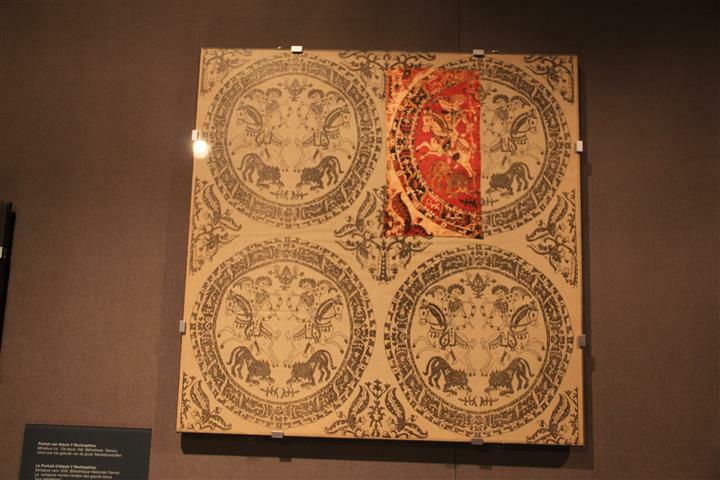 Recently a few reliquaries were covered with sixteenth-century textile. 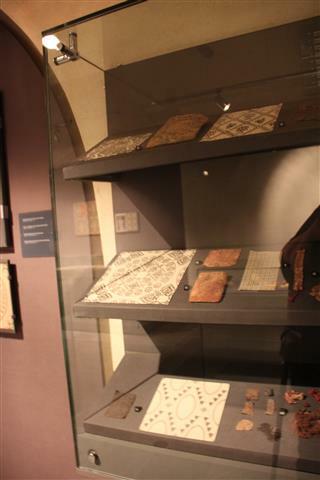 They are exhibited in one of the show-cases in our treasury. 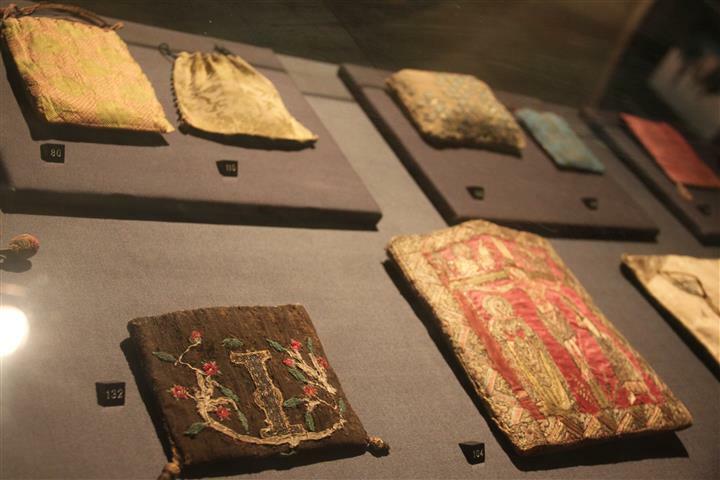 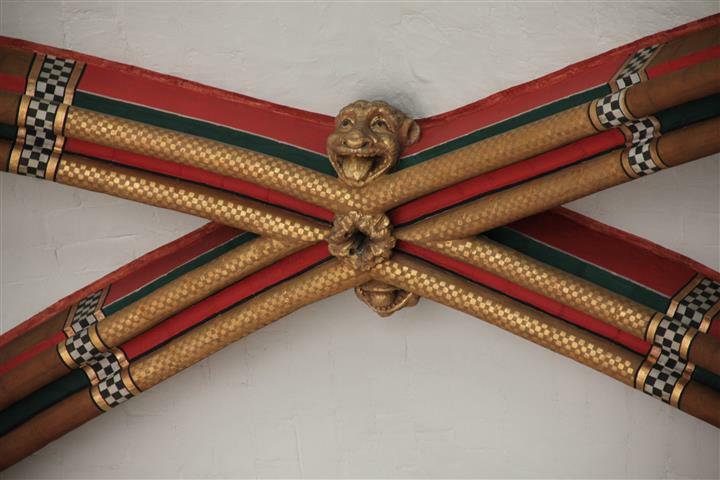 The textile bandage served also as a purse or bag, but also as a relic-holder, like the purse of green goldbrocade that was found in the shrine of Saint Servaas and that contained some small fragments of his bones. 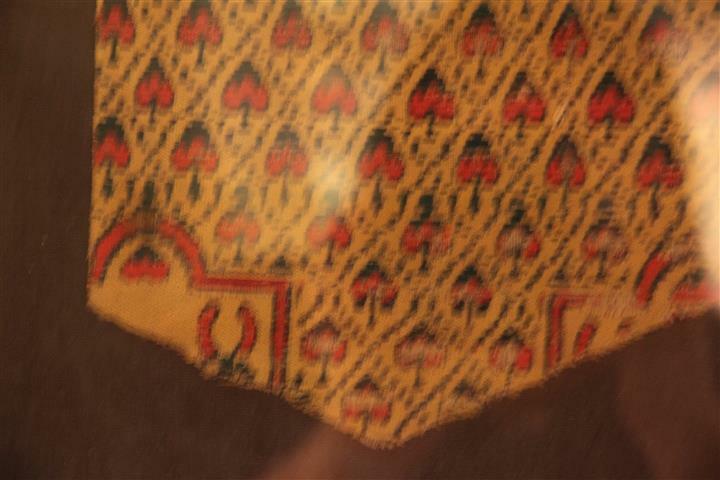 The light is deliberately fairly low in the room, this is intentional because light damages textiles, since I am aware of that I take (as is my usual habitanyway) all of my photographs without using the flash. 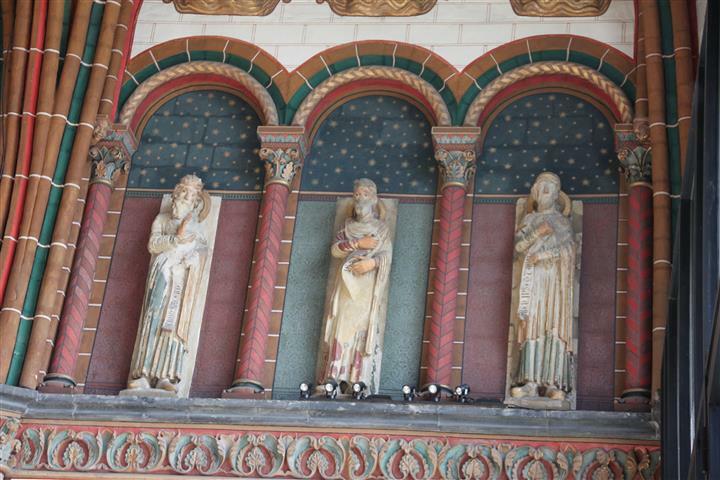 Some of the pictures in this post are therefore slightly out of focus, keeping very still whilst leaning on crutches is a talent I’m still perfecting despite almost five years on sticks. 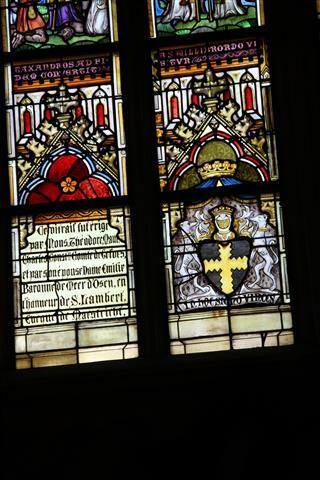 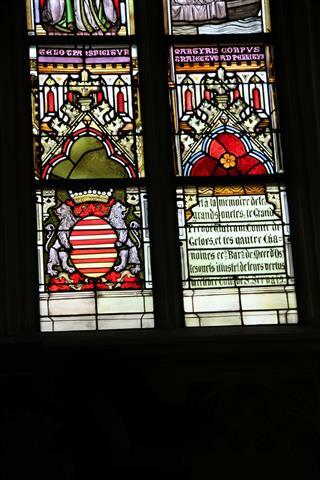 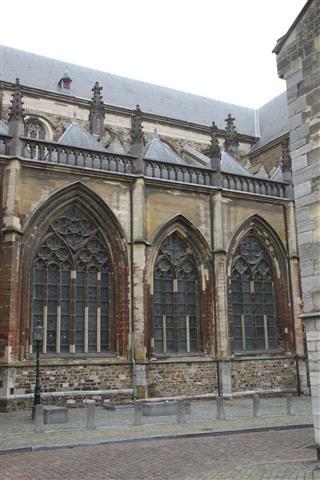 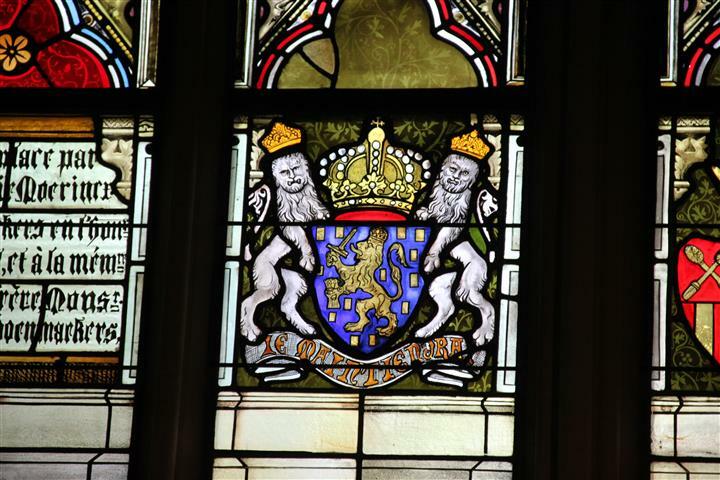 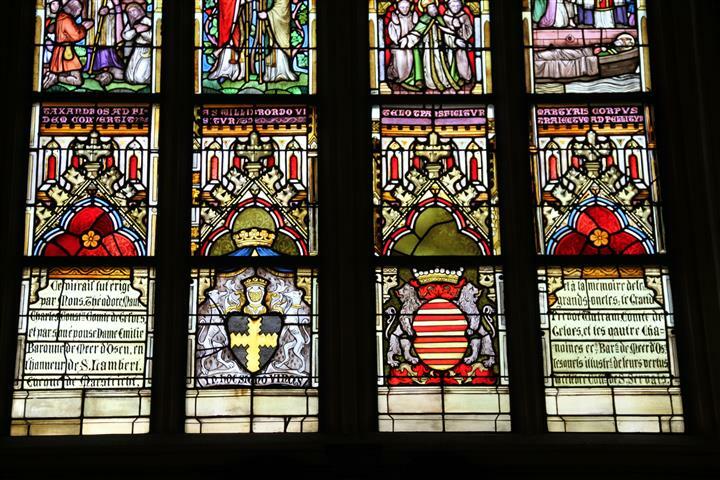 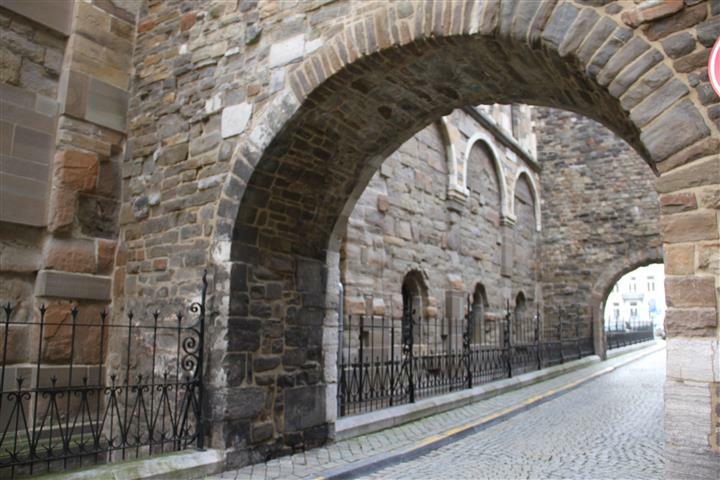 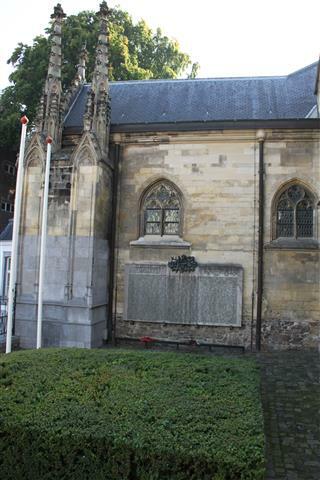 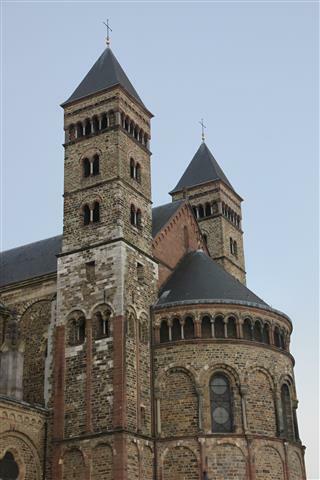 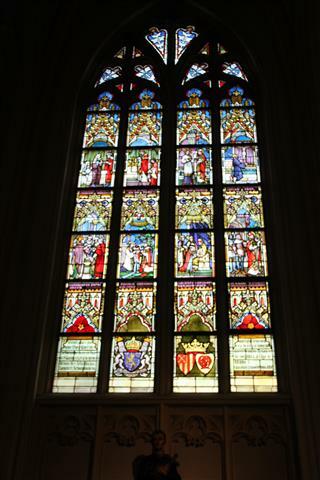 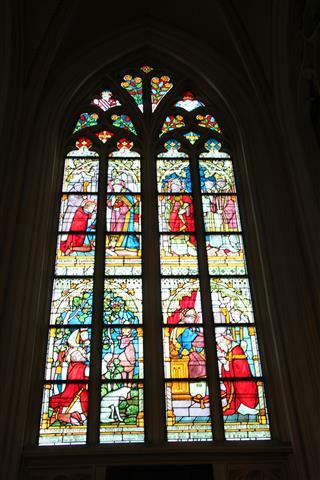 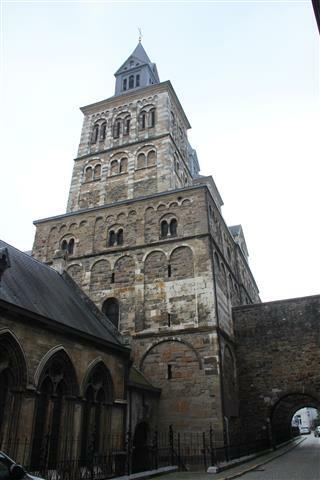 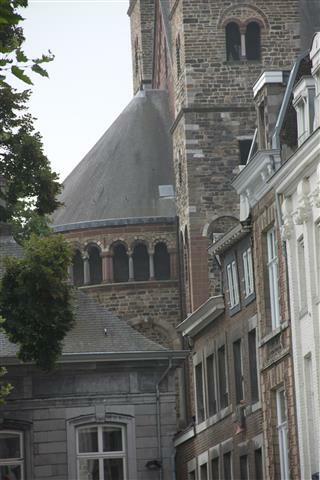 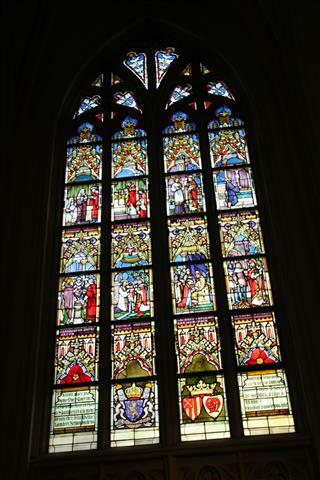 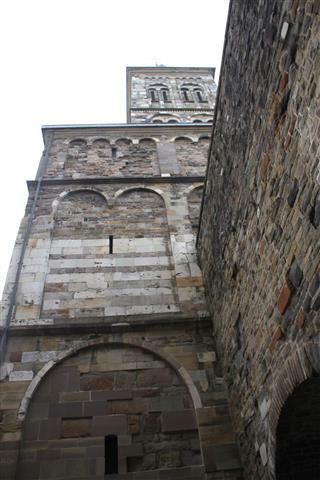 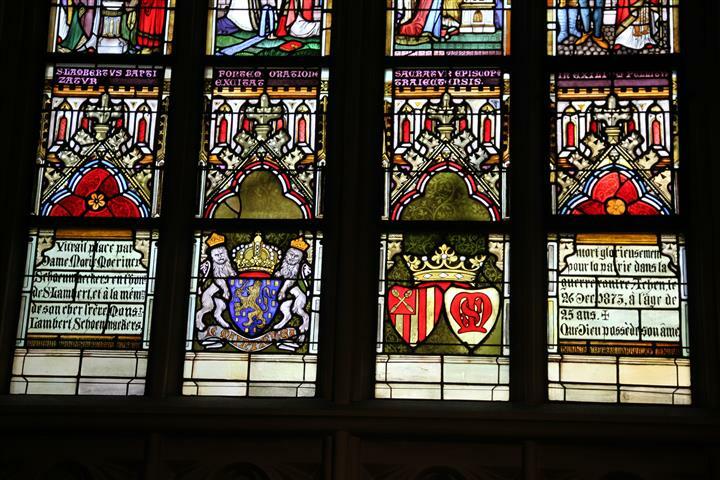 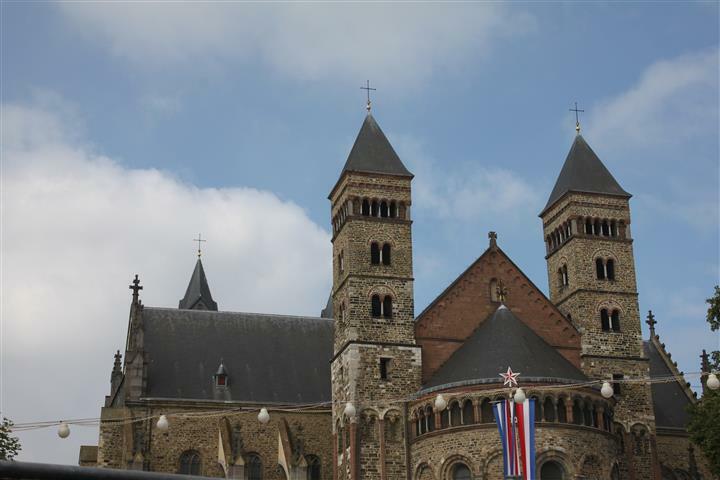 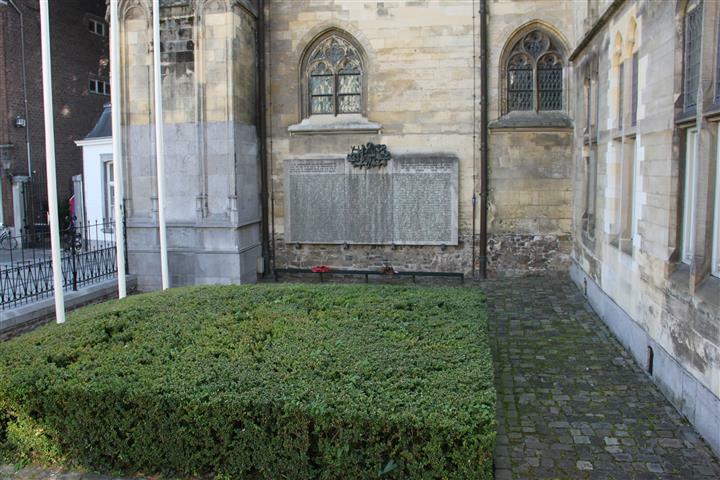 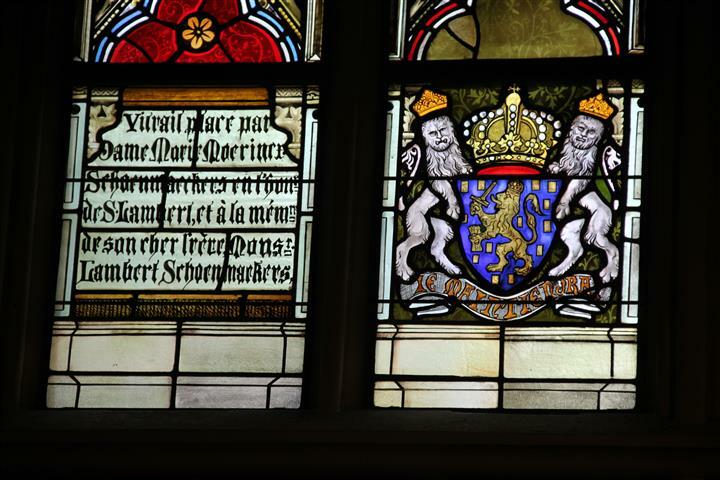 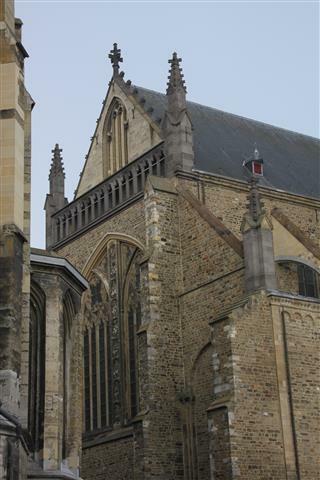 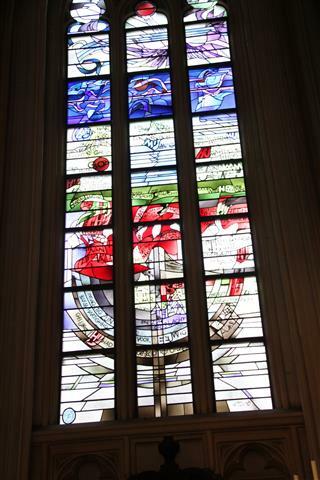 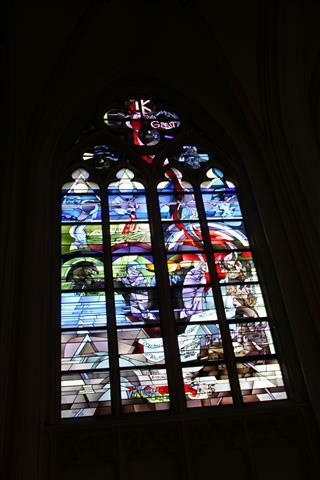 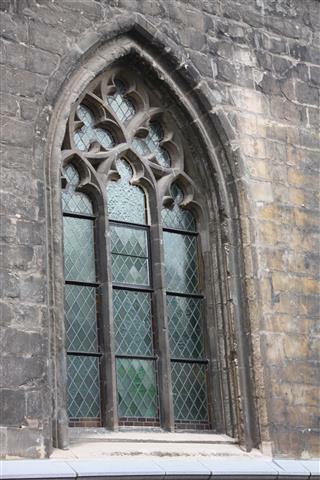 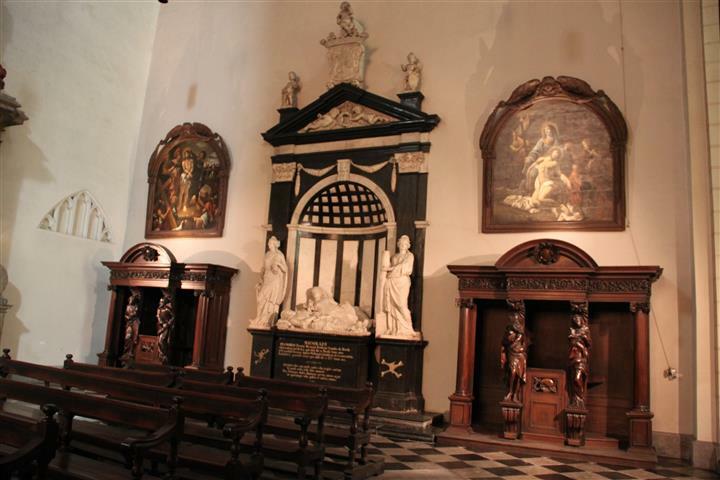 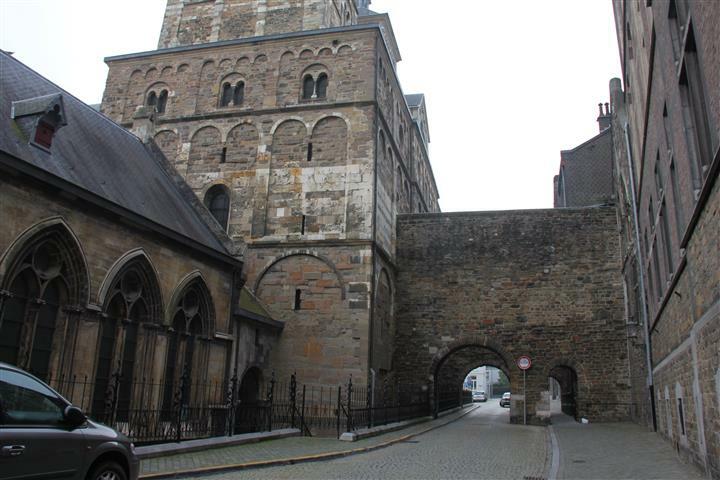 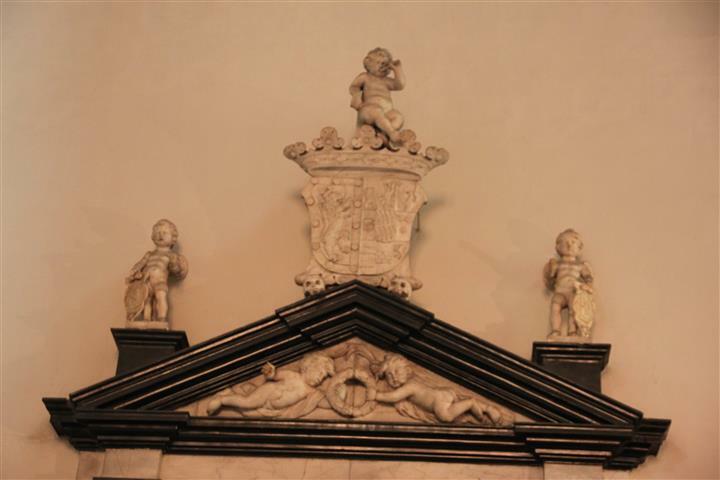 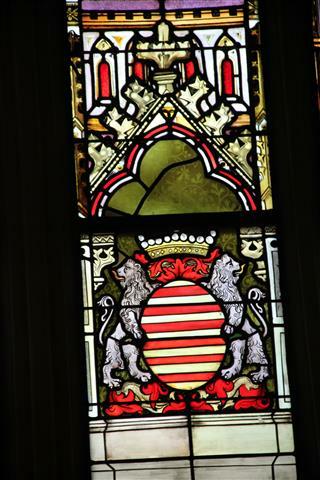 Several years ago Family Kiwidutch visited the southern Dutch city of Maastricht and one day I left Himself and the children to explore the city center whilst I visited the Basilica of Saint Servatius. 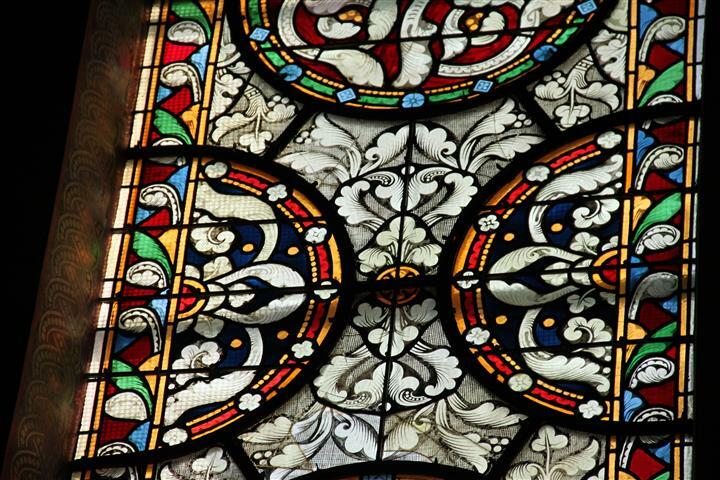 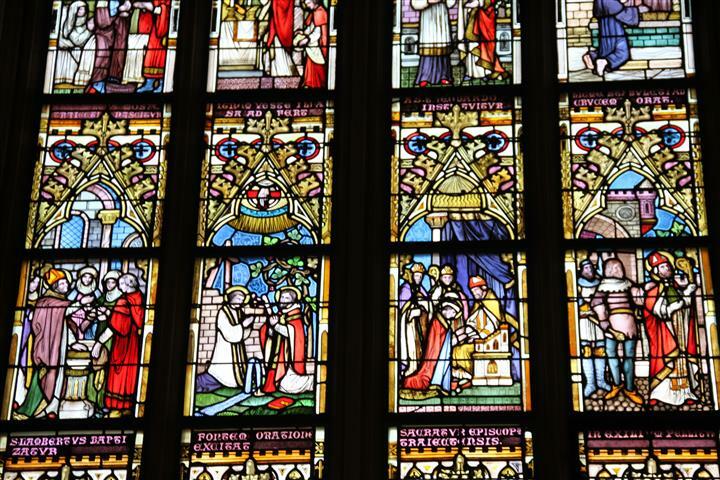 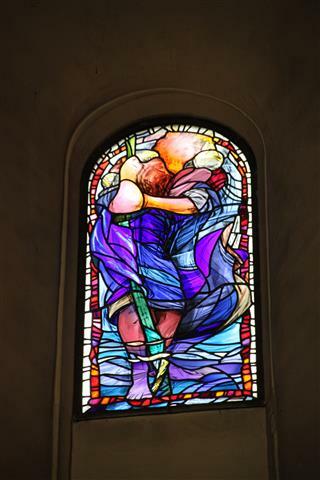 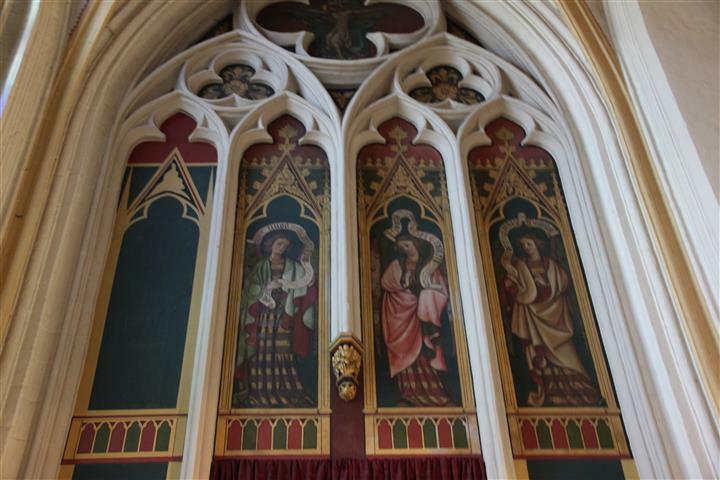 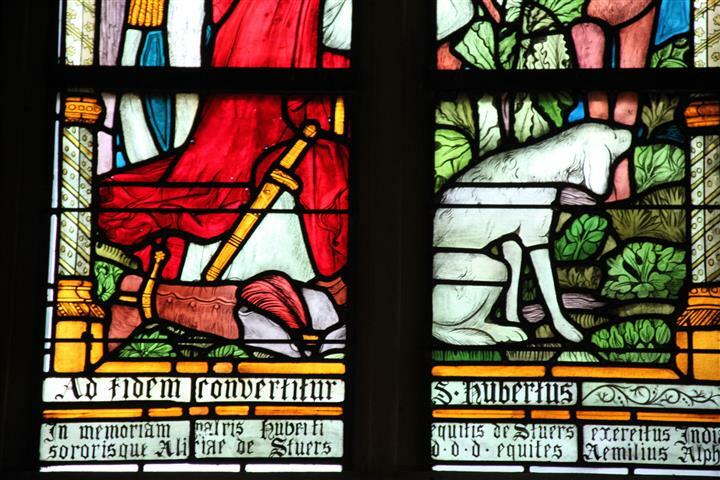 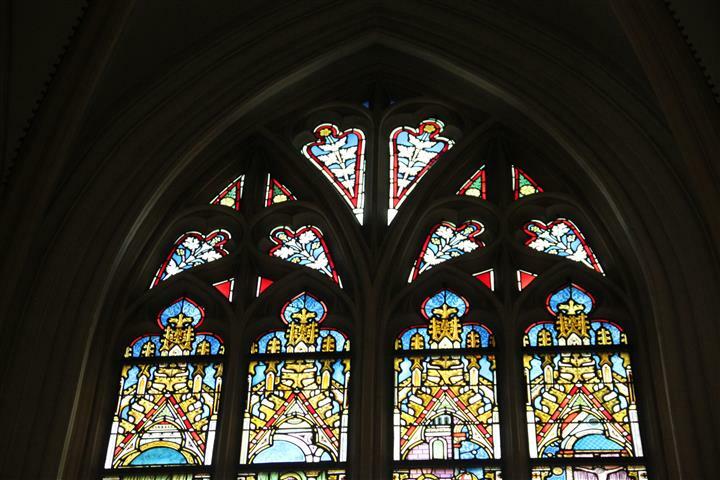 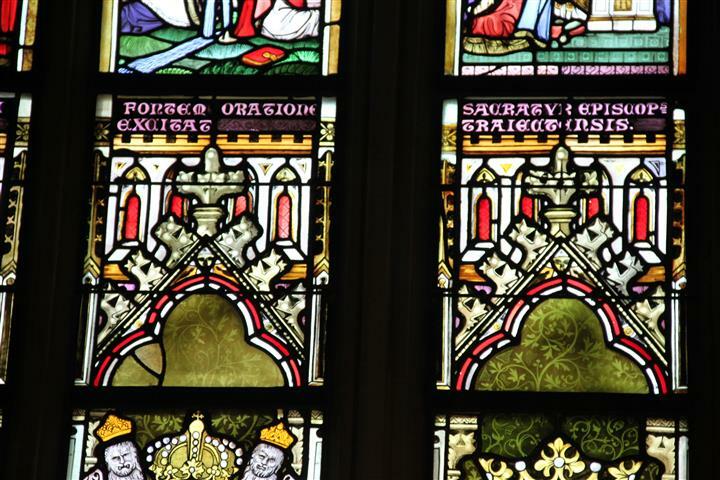 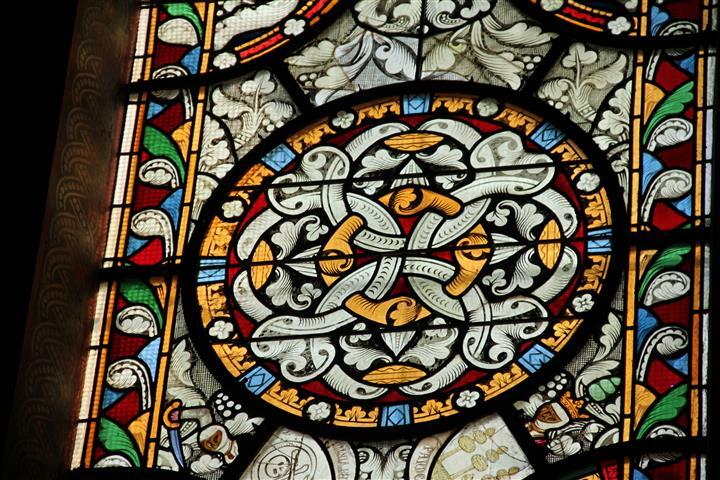 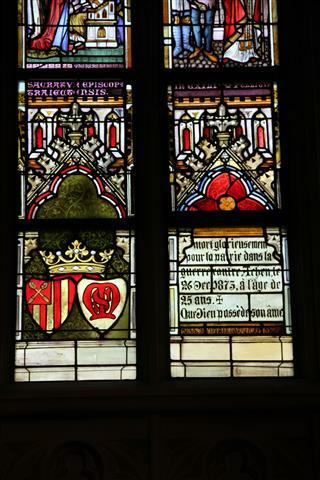 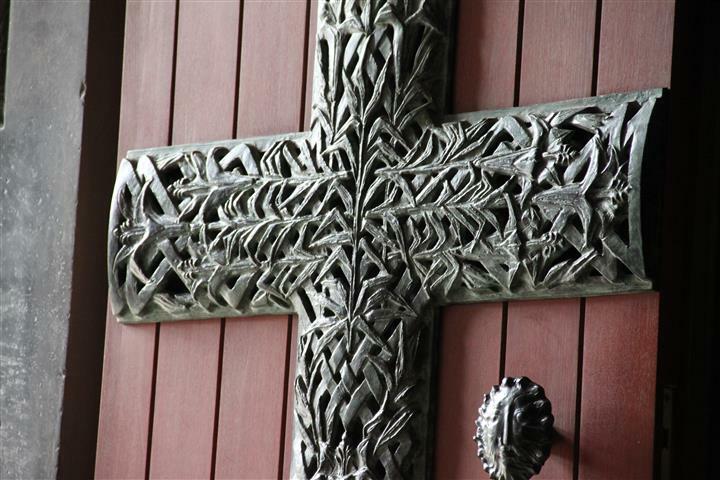 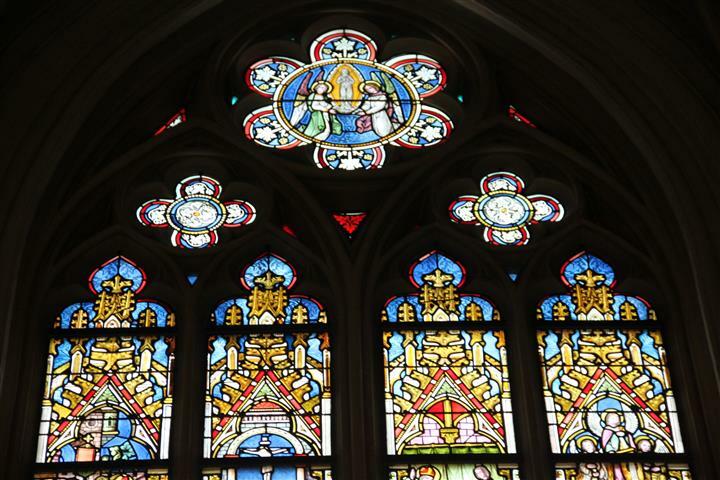 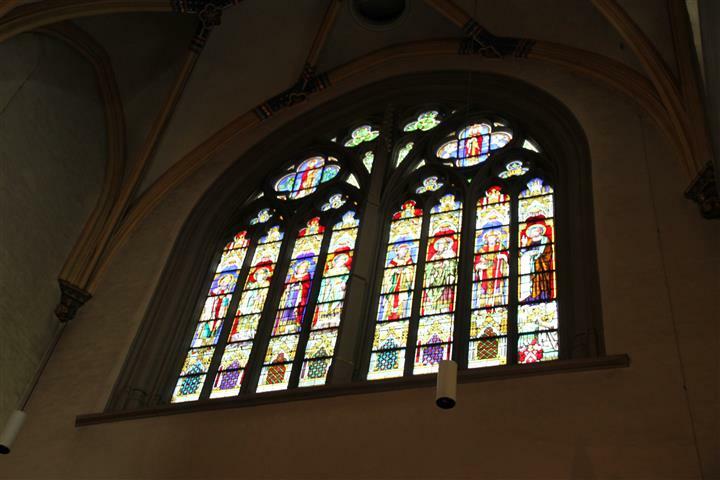 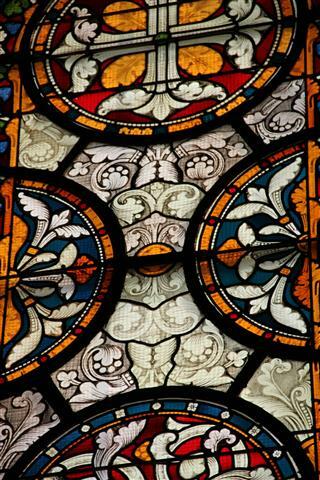 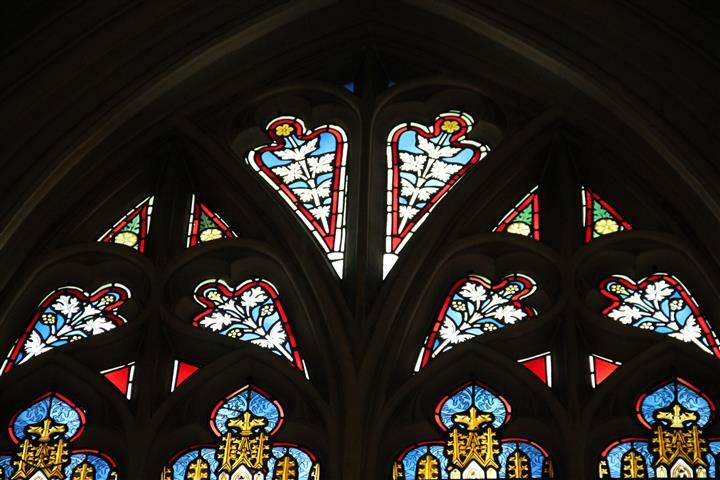 I like visiting churches, the peace and tranquility revitalizes me and I love the stained glass, wood and stone carvings that demonstrate a level of skill and workmanship seldom demonstrated in the twenty-first century. 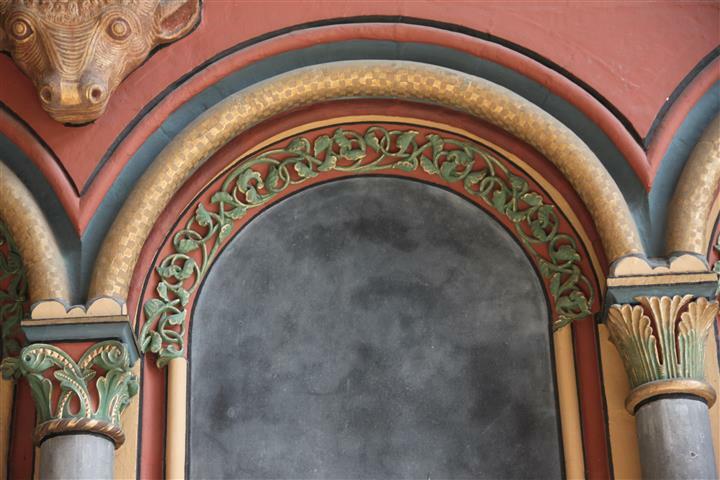 This alcove is yet another example: on one side wall there are panels of beautiful detail: the pattern includes large floral motifs that surround several large circular panels, inside of which are something that might be a boat, castles, crowns and star. 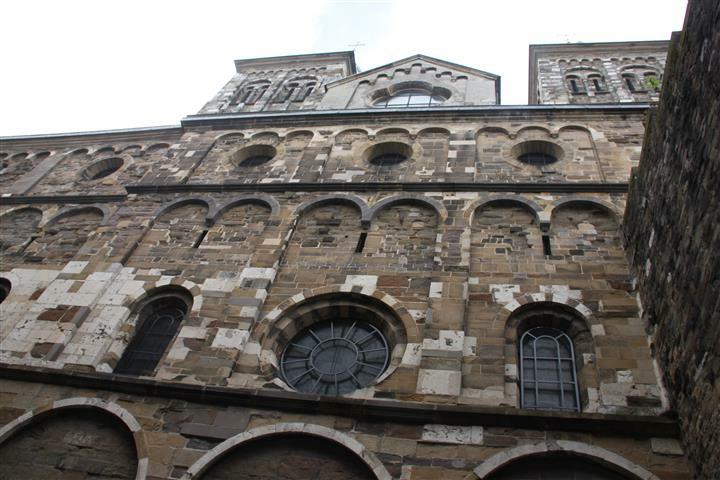 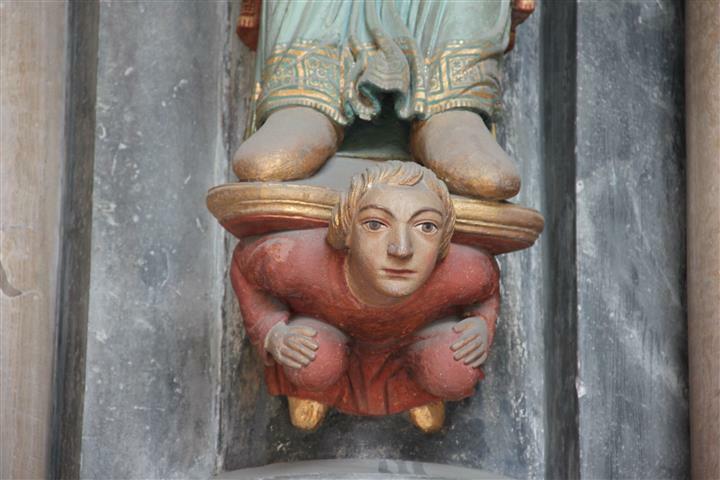 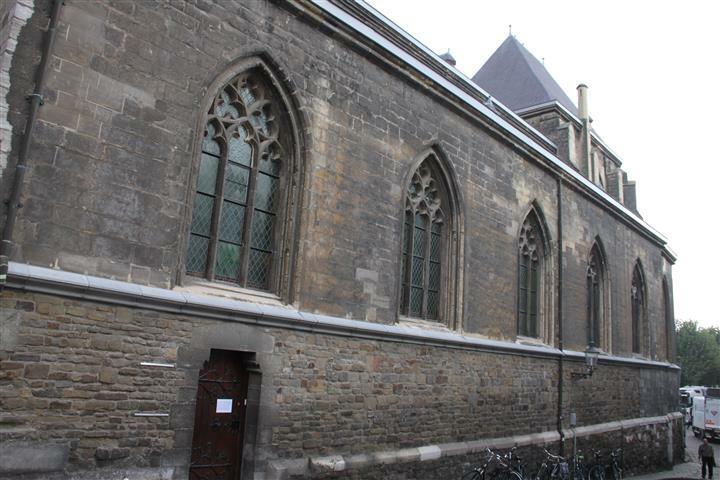 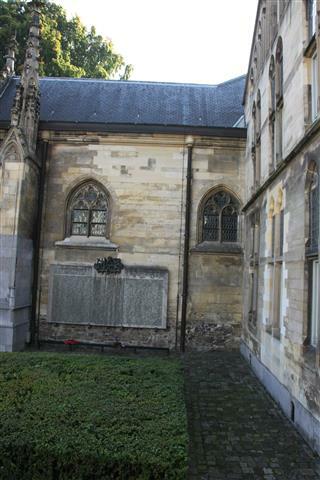 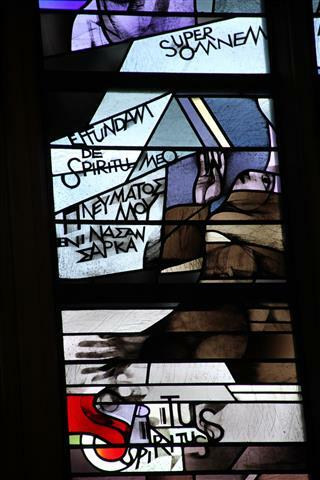 I’m visiting the Basilica of Saint Servatius located in Maastricht and a few posts ago I hinted that there was maybe a lot more to see after peeping through a massive door to the side of the Nave. 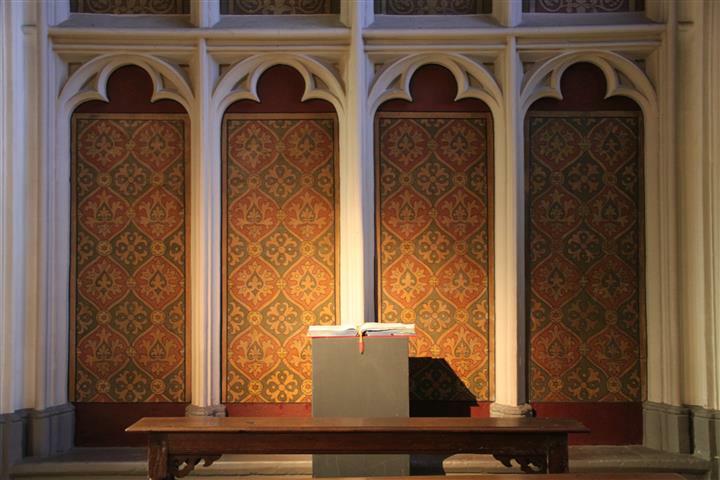 I’ve already made a blog post about the floors in this “room” Fifty Shades Of Grey Taking Place On The Floor… … but now it’s time to explore the rest of this stunning structure. 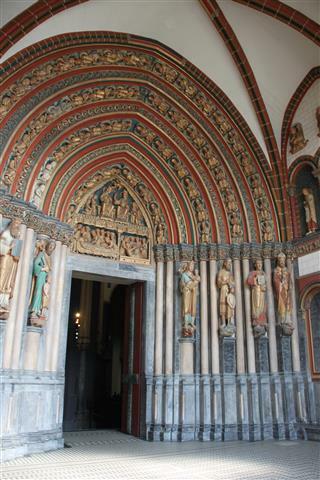 By chance a group of German tourists arrived just as I entered, obviously on a bus tour and since they had their own guide. 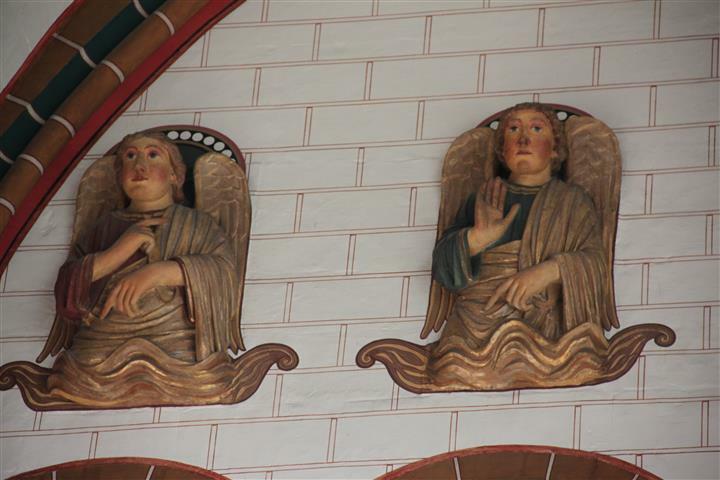 My German wasn’t at all good enough to keep up with the speed with which the guide was delivering her information so I focused on trying to get photographs of the details around me minus unintentional tourist heads, arms or cameras being held high accidently getting into my shots. 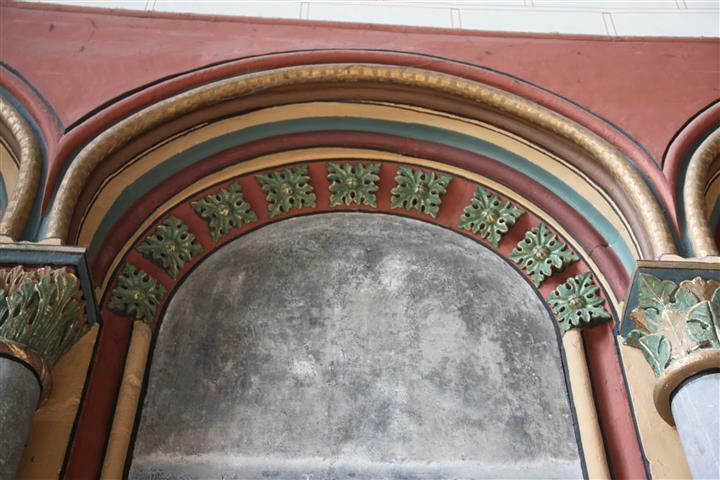 Over and around the door, there are a series of archways that reaches right to the top of the vaulted ceiling. 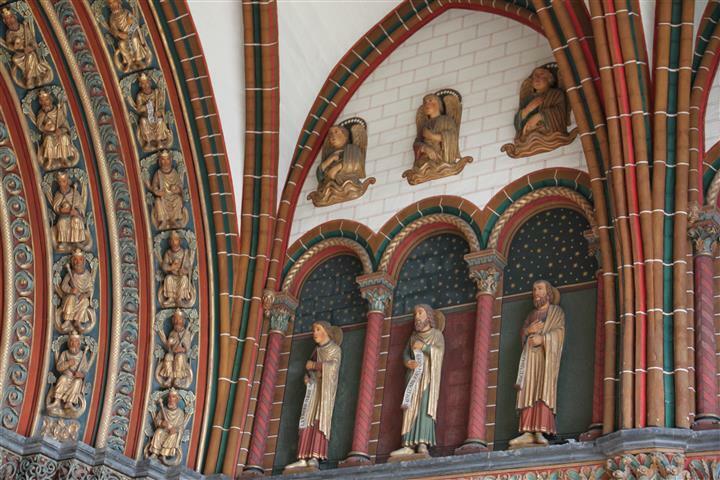 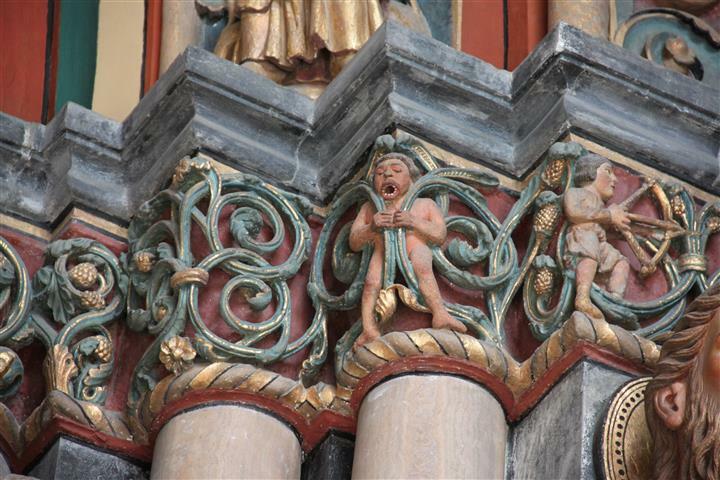 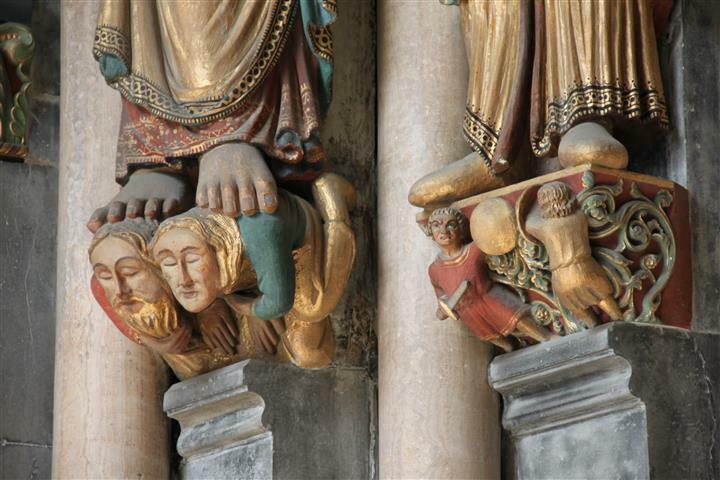 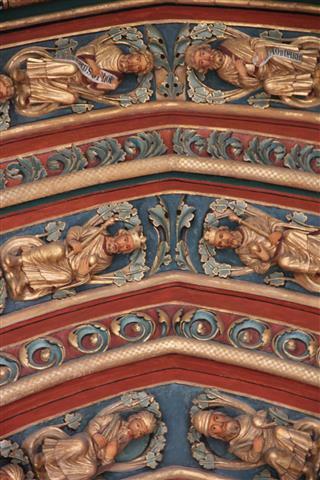 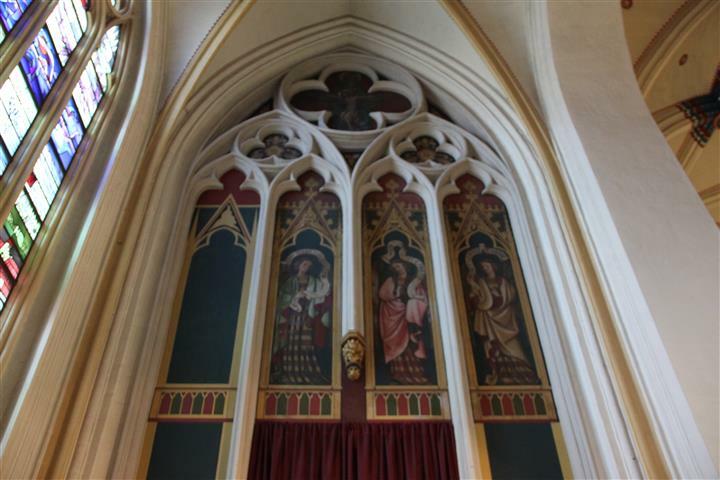 These arches incorporate pillars and figures both large and small, and in such numbers that you hardly know where to look first. 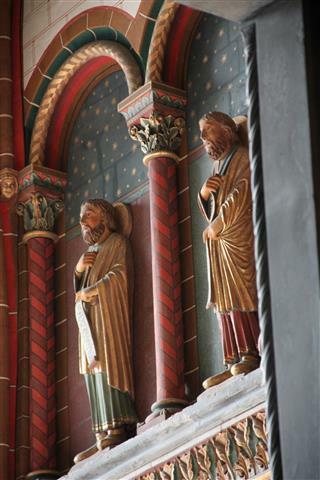 There are also alcoves on the walls to the left and right of the door, these house six large figures on each wall and I assume represent the Apostles of Christ. 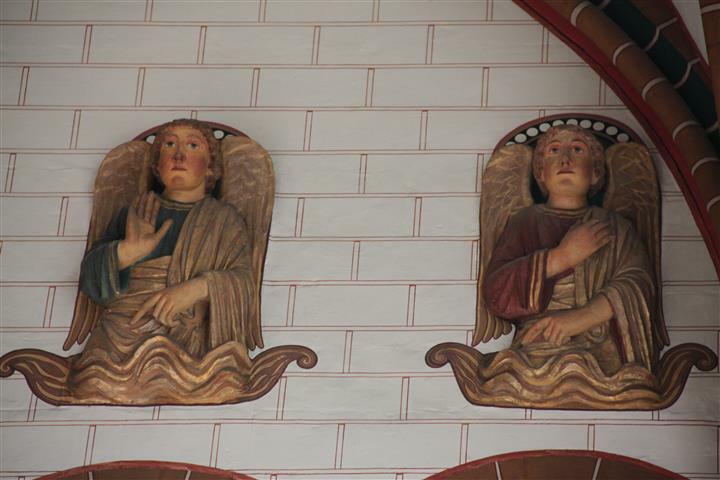 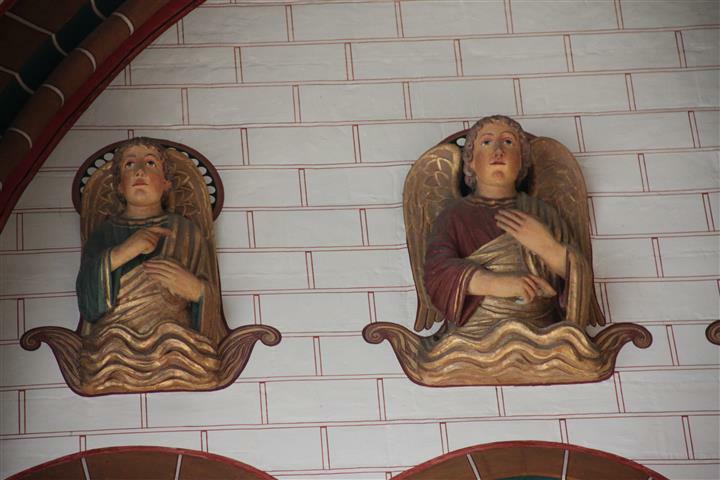 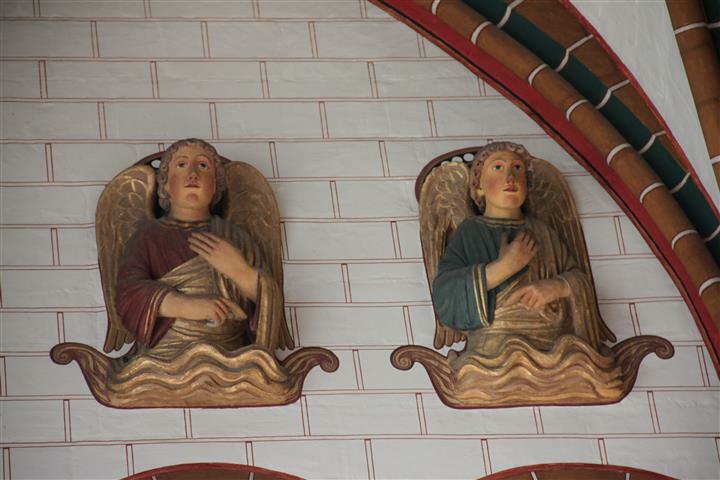 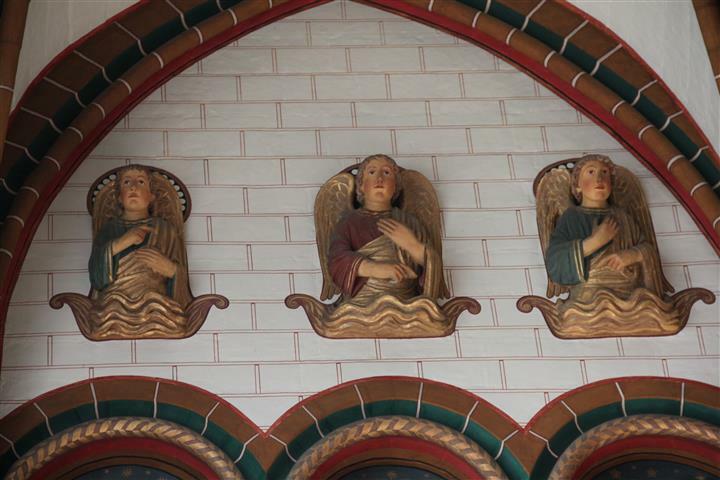 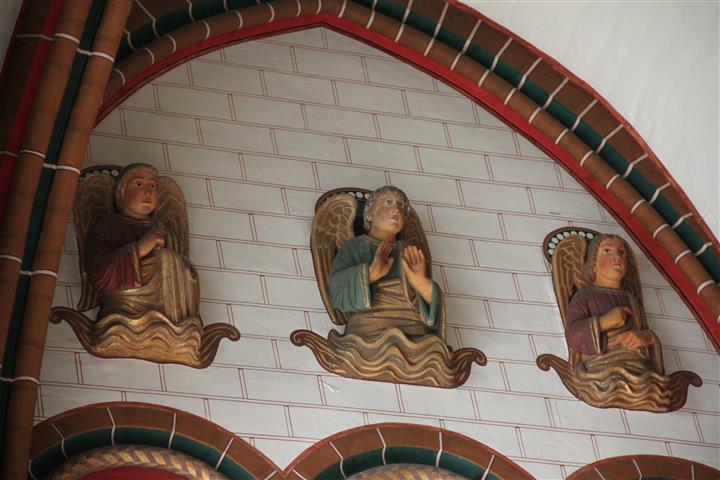 Above each of these are another six half-figures of angels. 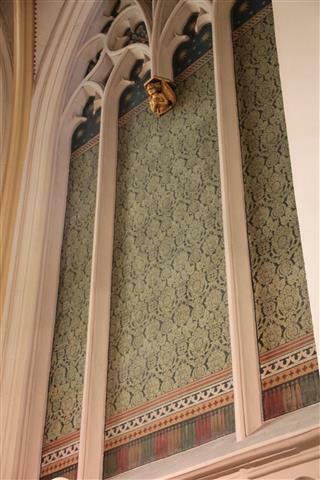 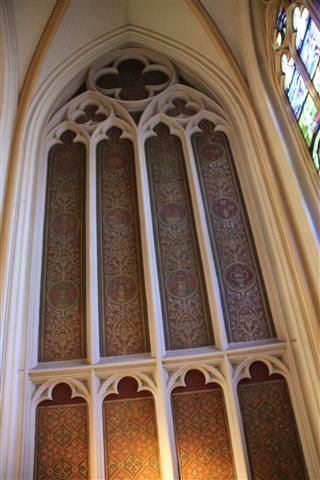 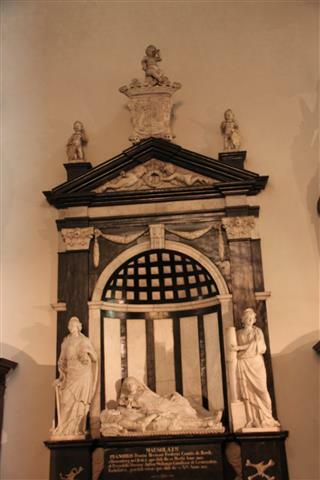 The wall opposite the door is comprised of floor to ceiling plain glass windows, as outlined in my earlier post.There are more large figures in the door archway, they hold or are with children, musical instruments and emblems of the church. 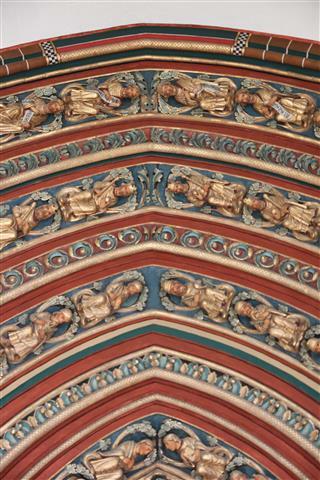 Above these are literally tens of figures, they arc up from the left and the right, joining in the centre of each arch. 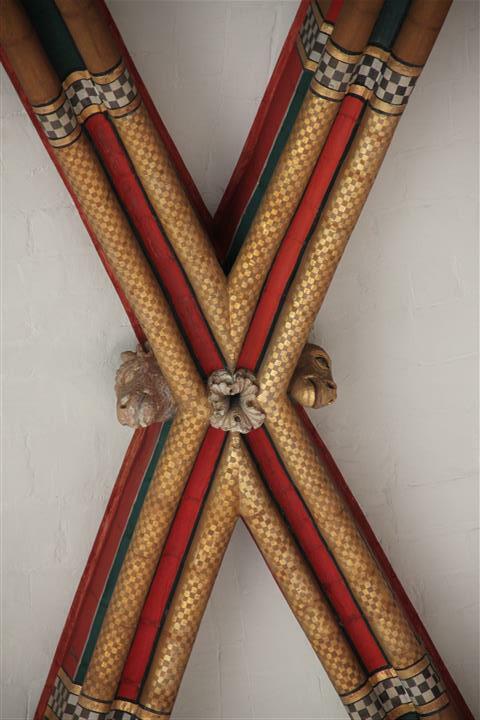 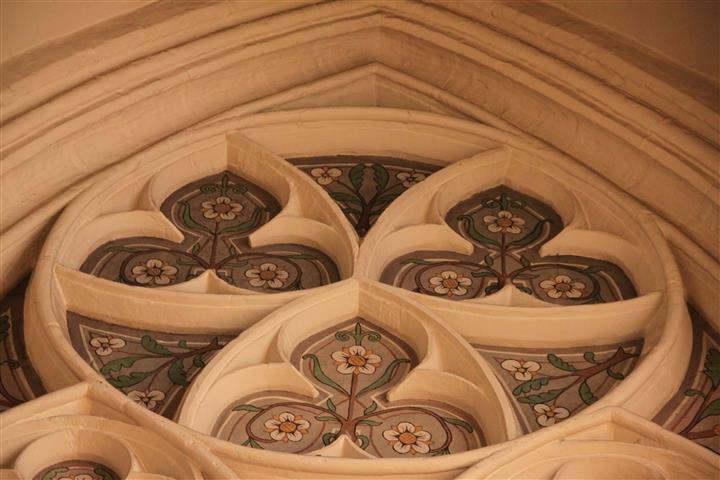 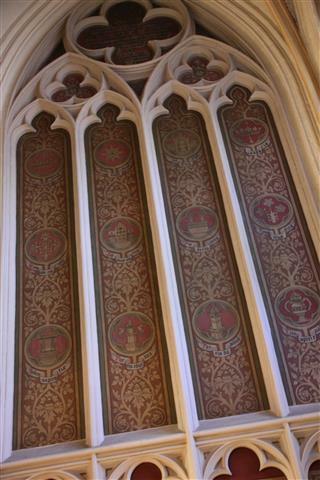 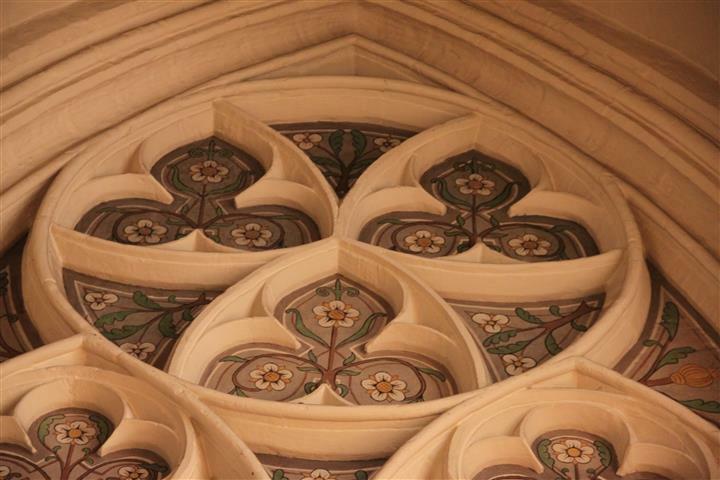 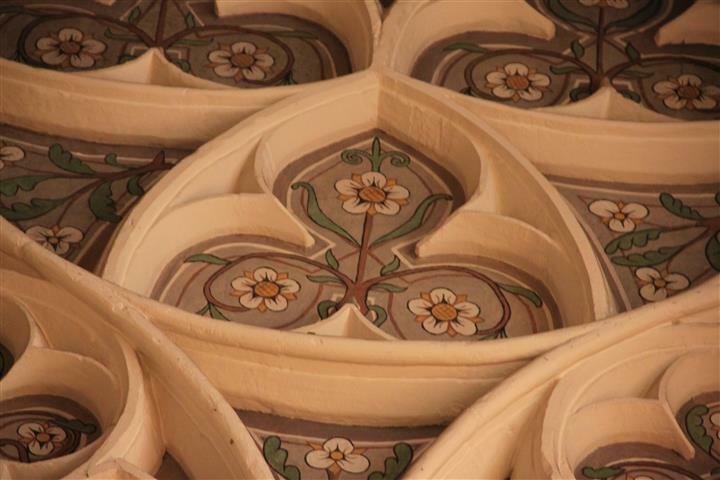 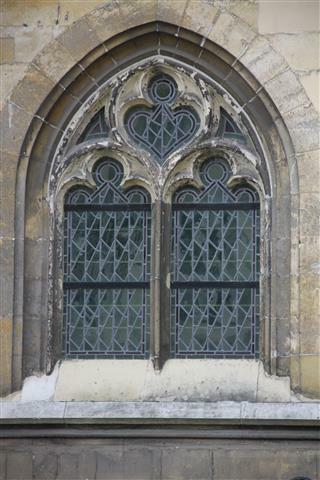 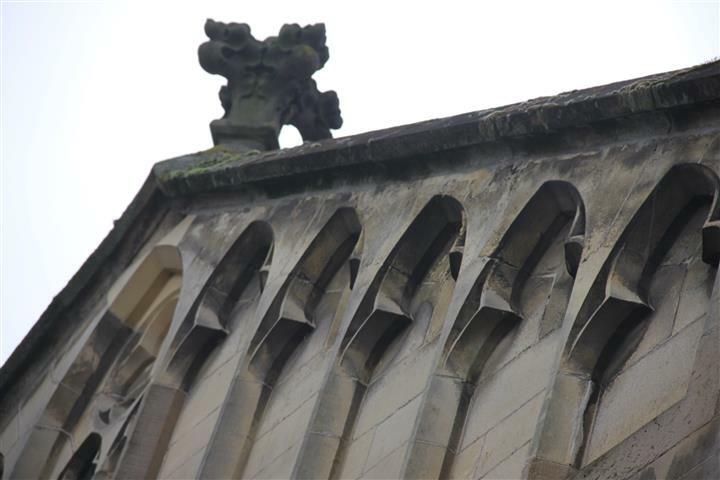 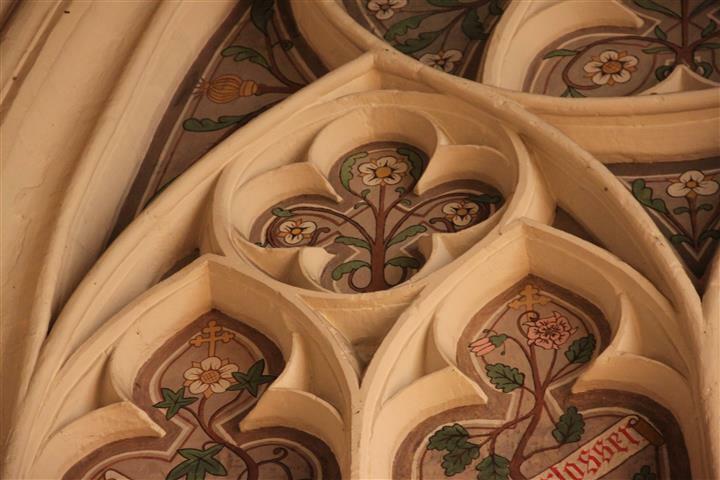 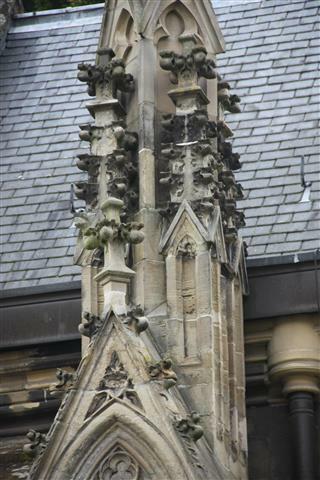 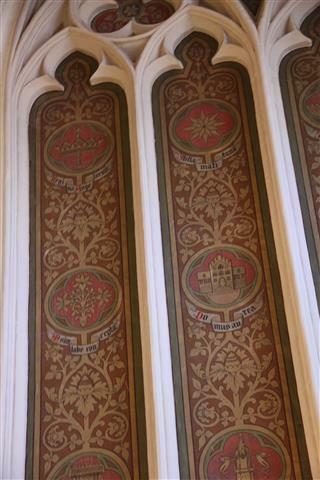 There is floral decoration between these rows and also in the side wall arches. 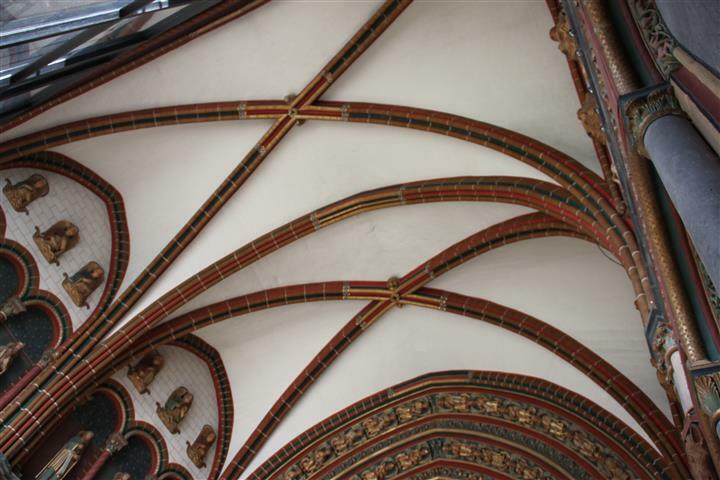 Then there are the two parts of the ceiling, more arches to support the vaulted roof line. 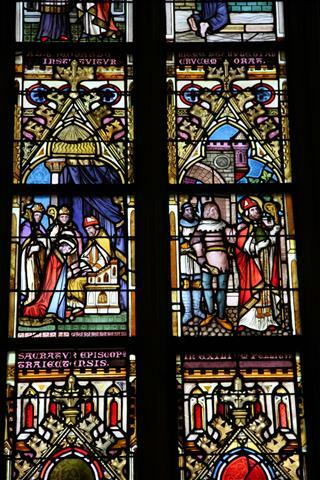 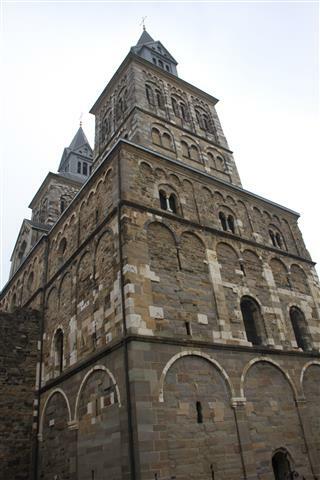 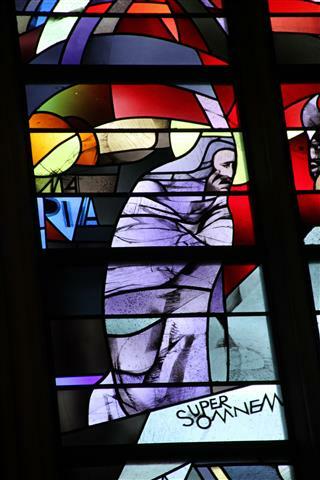 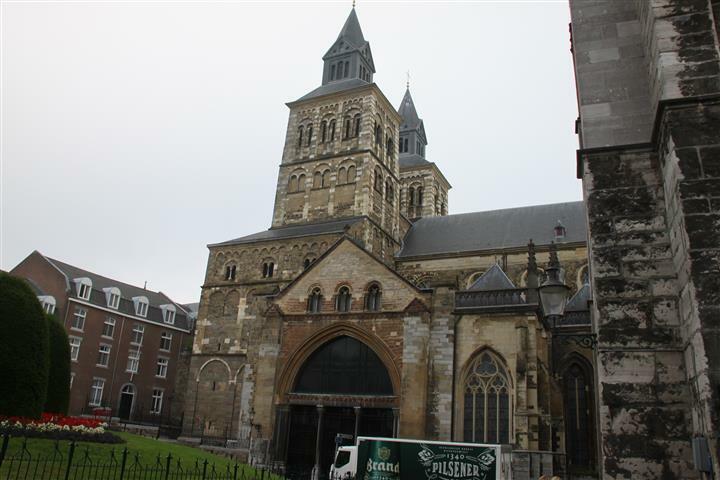 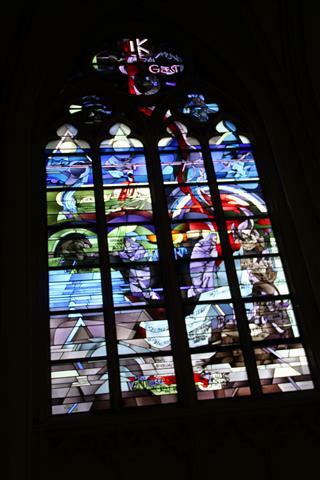 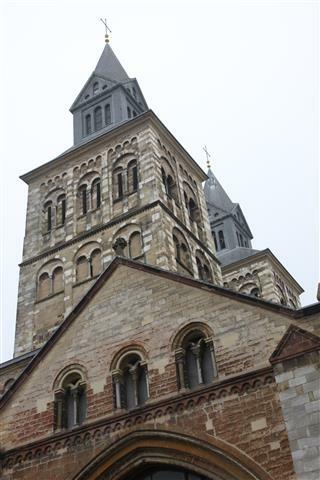 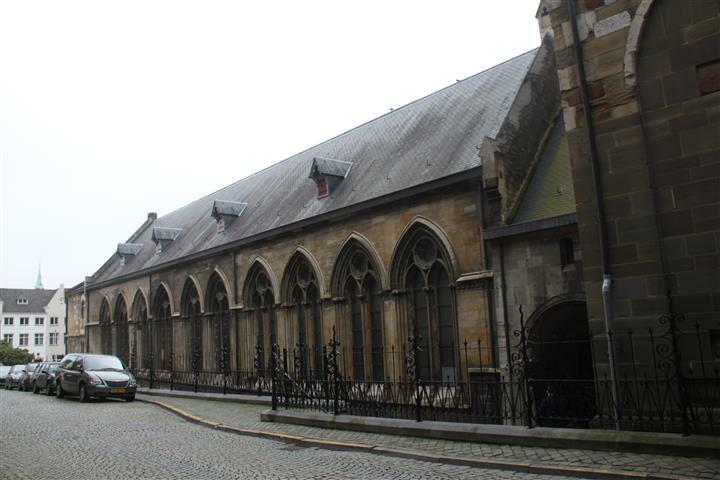 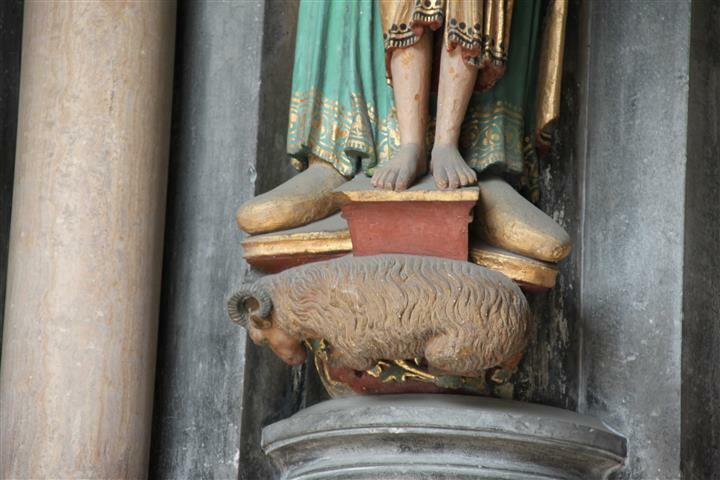 I continue to be taken my complete surprise during my visit to the Basilica of Saint Servatius in the Dutch city of Maastricht. 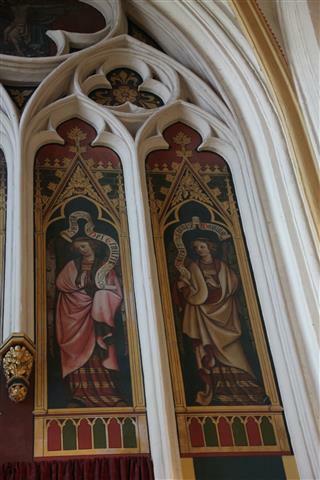 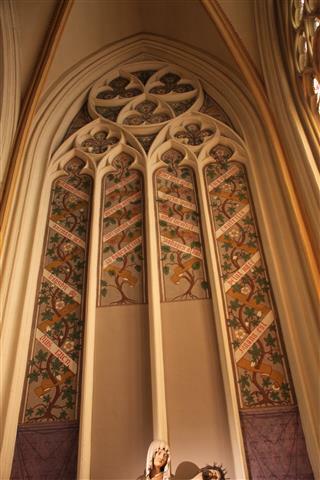 This time it’s another alcove, painted to perfection with composition, colour and detail in spades. 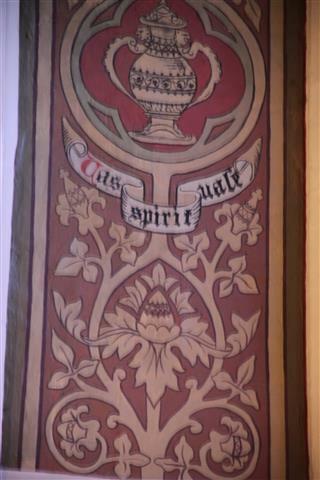 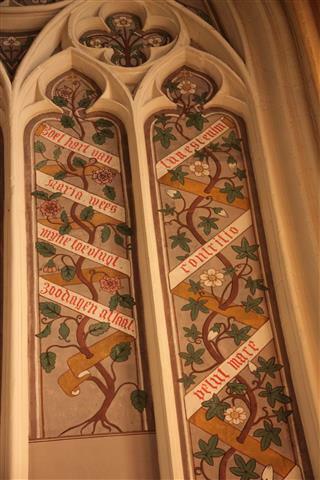 The theme of this alcove is the “ Tree of Life” and the painting depicts a vine-like tree that snakes itself skyward and judging by the lettered banners that intertwine the foliage, it might be a phrase of some sort but I’m not certain what it actually says. 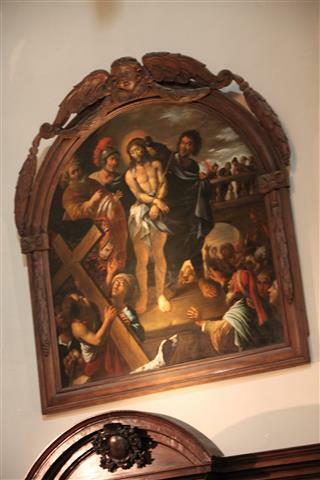 The painting appears to be fully complete in that at the base of each of the “trees” features a proper tree-like base and root system, but the entire thing, when seen from further back, looks less complete, a little as if it were meant to take up more space, or that instead of the statue of the crucified Christ that stands in front of this painting,that formerly something far taller stood next to the wall in this spot. 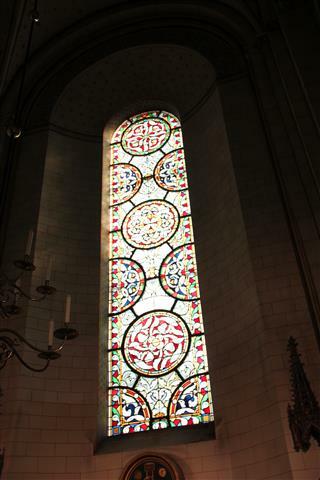 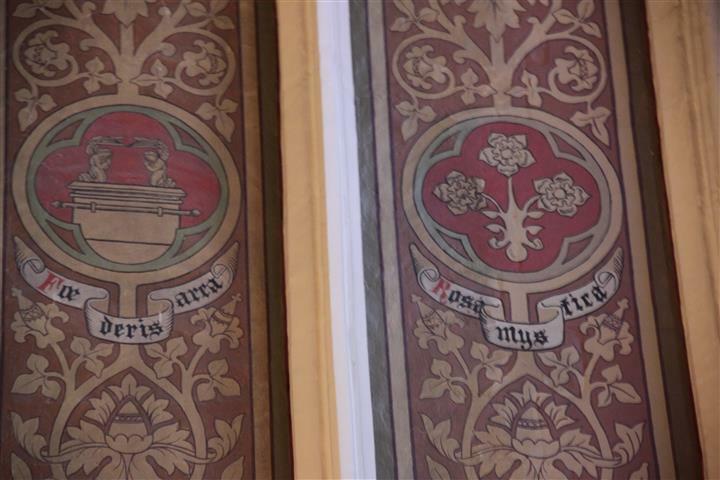 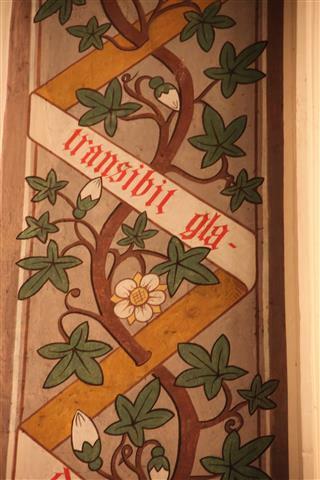 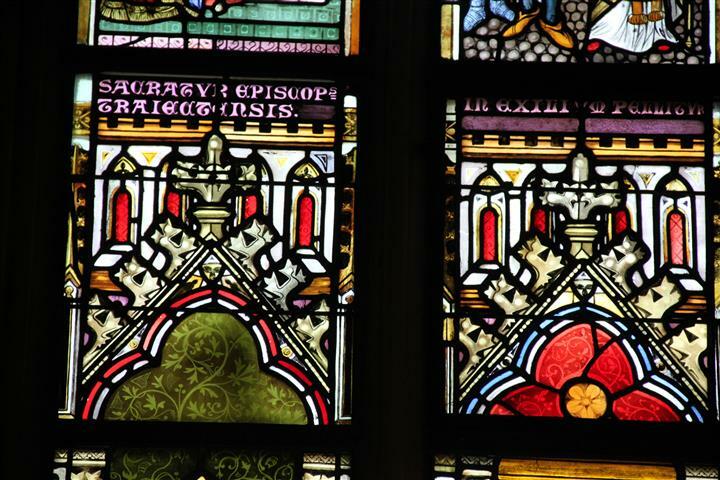 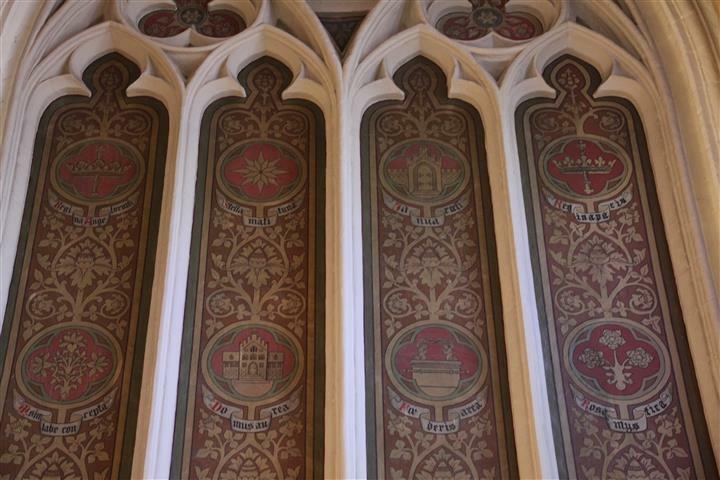 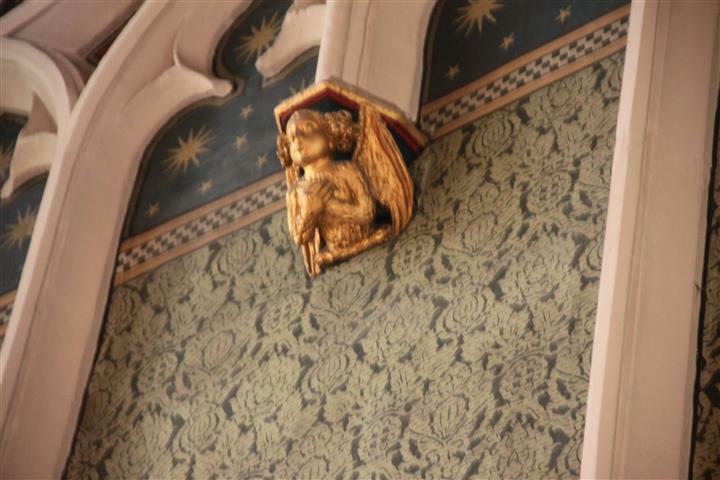 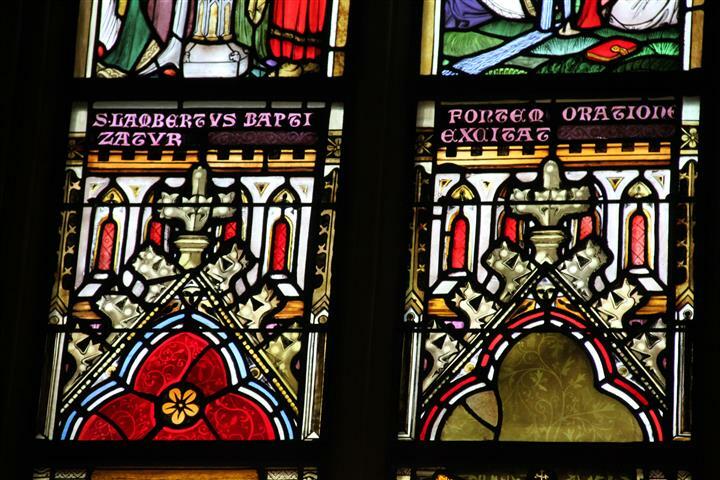 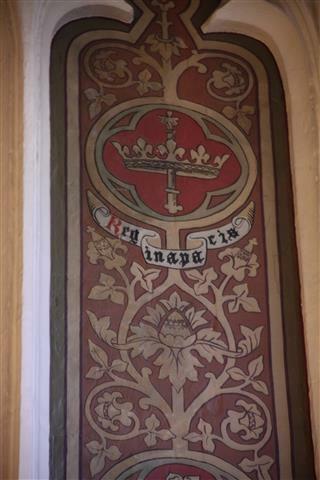 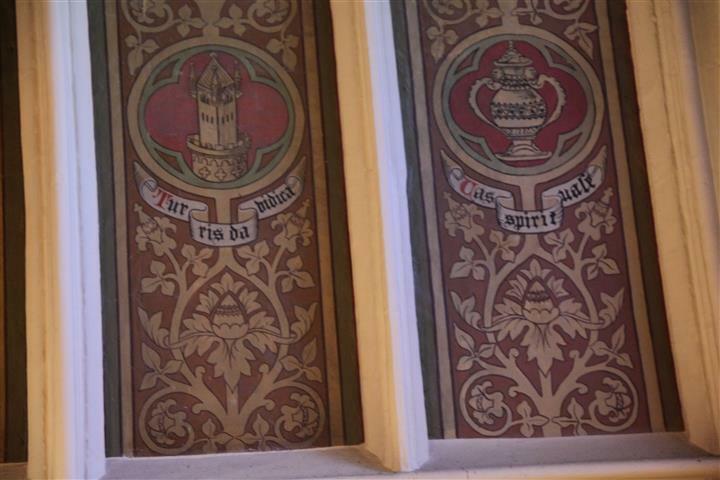 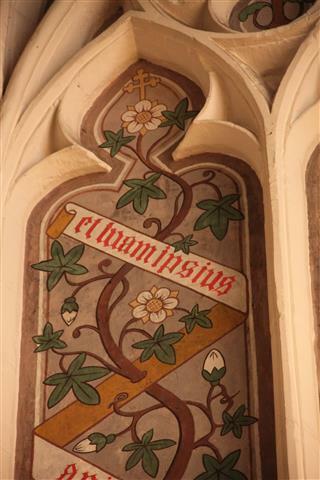 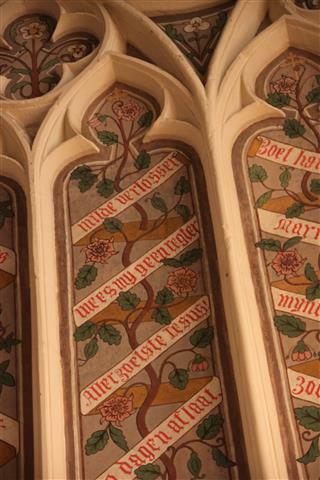 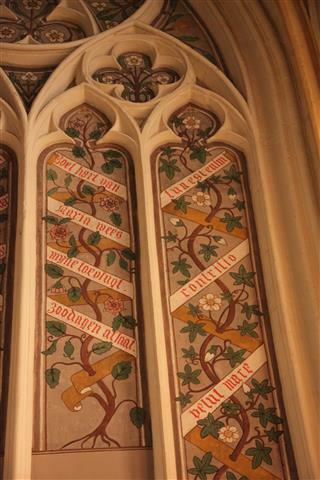 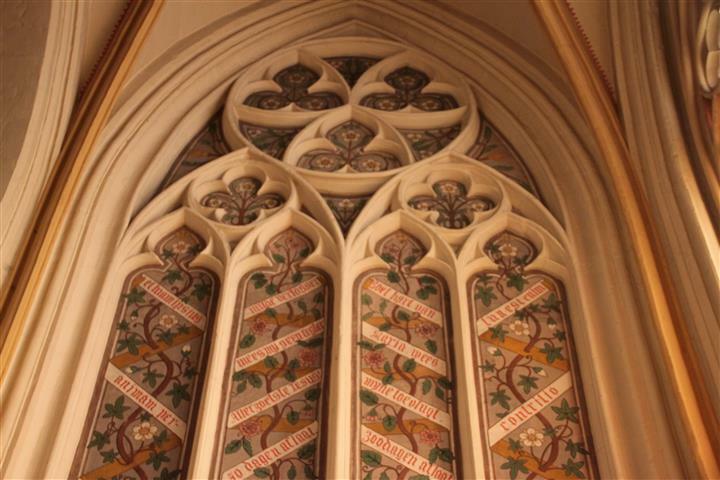 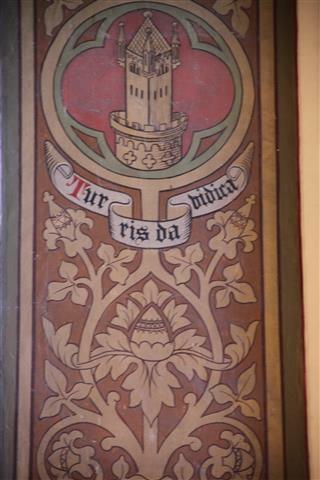 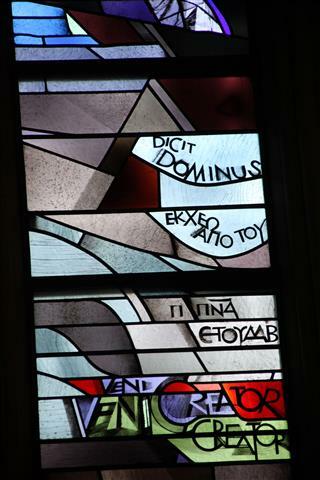 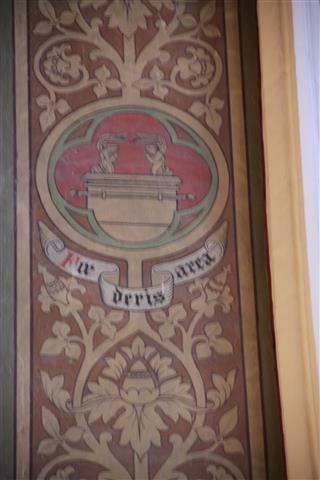 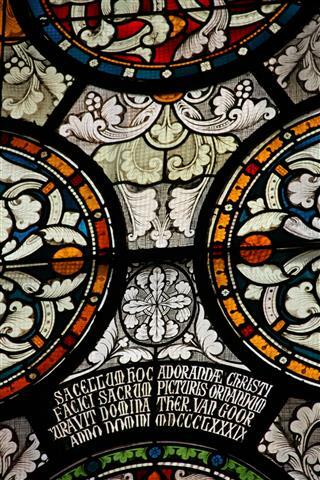 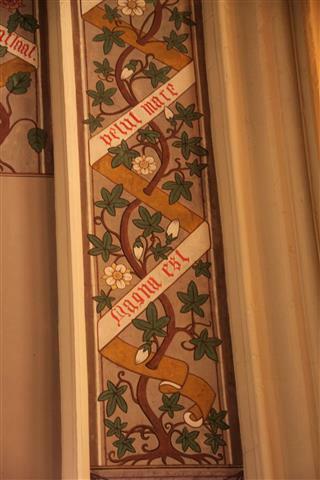 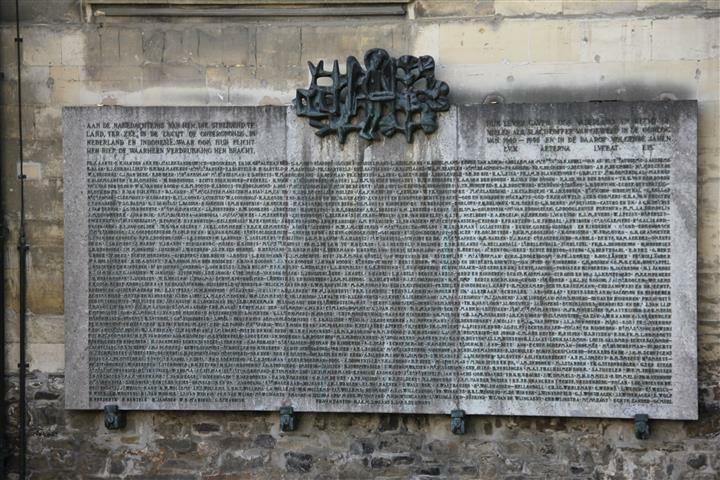 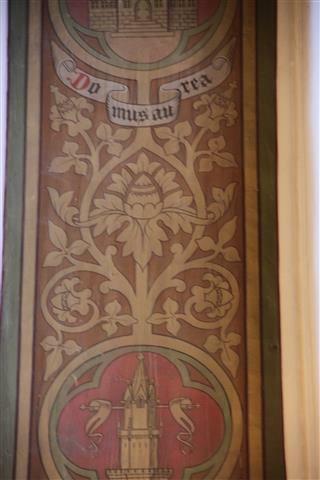 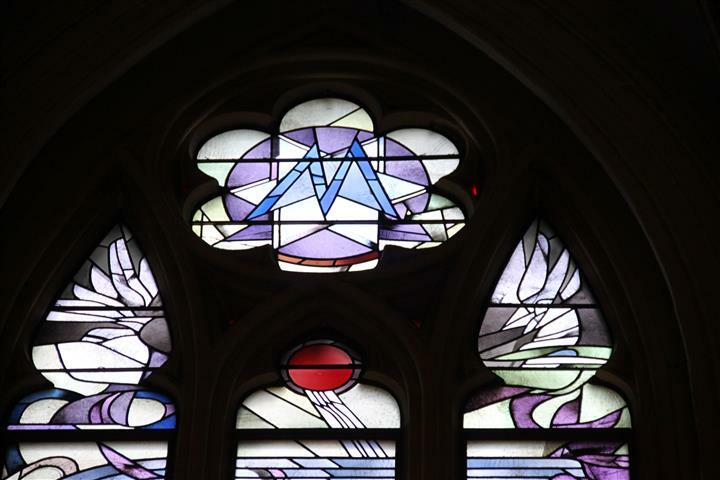 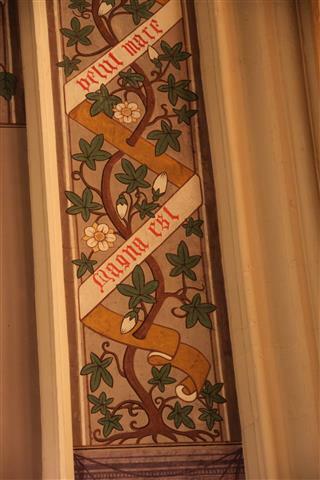 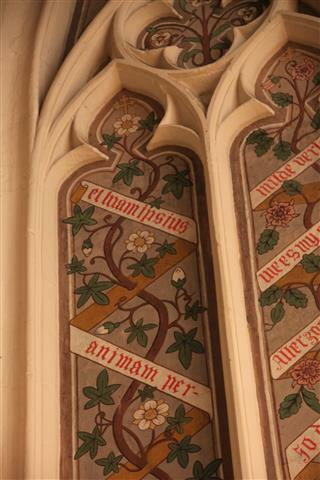 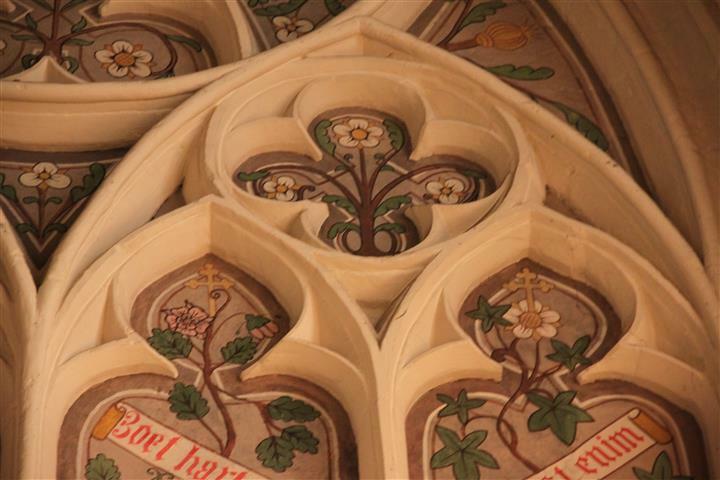 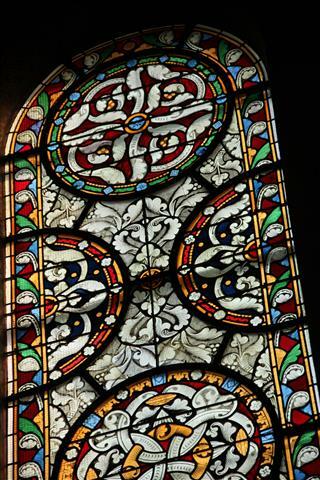 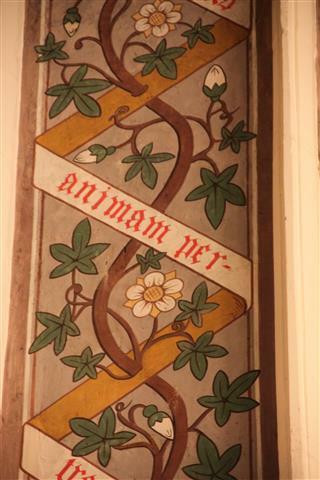 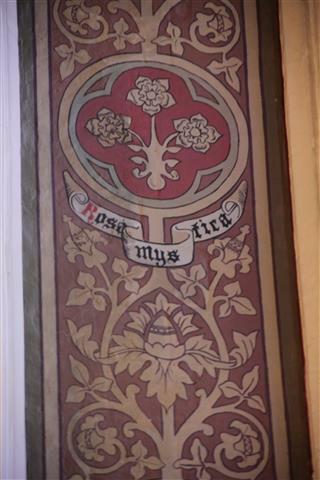 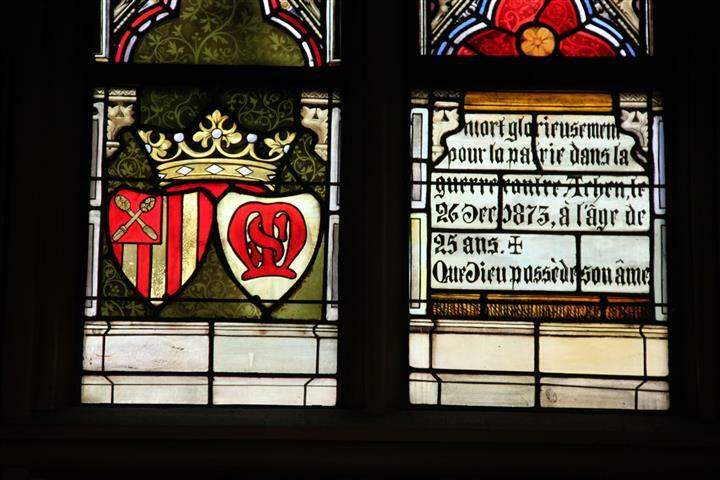 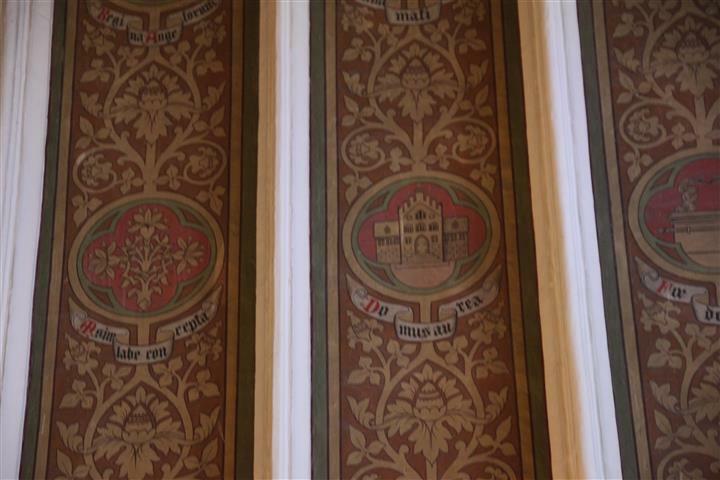 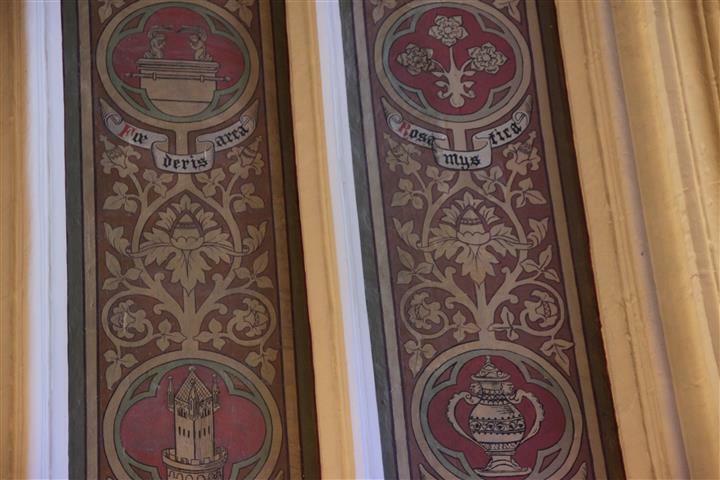 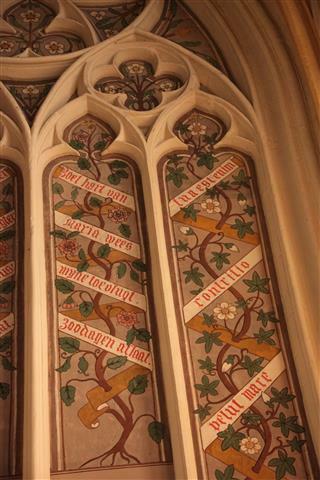 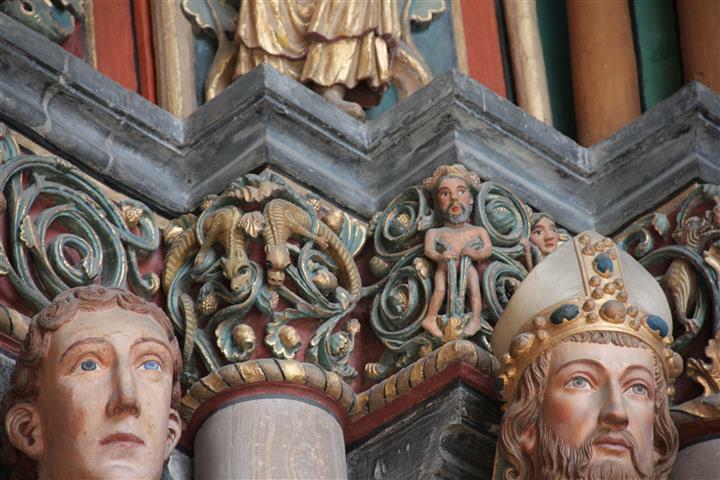 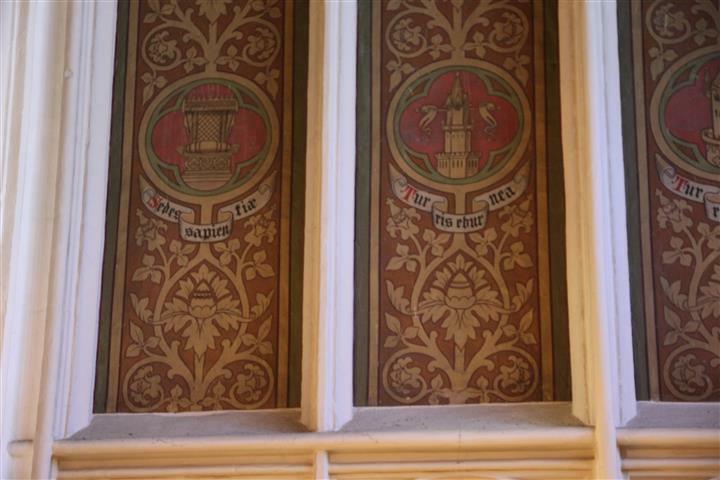 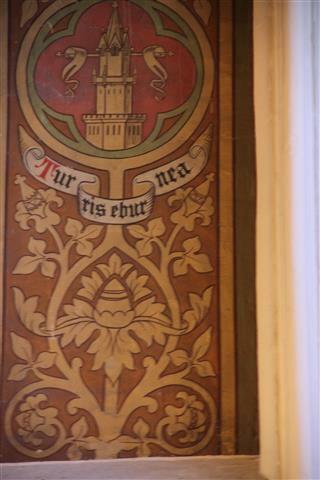 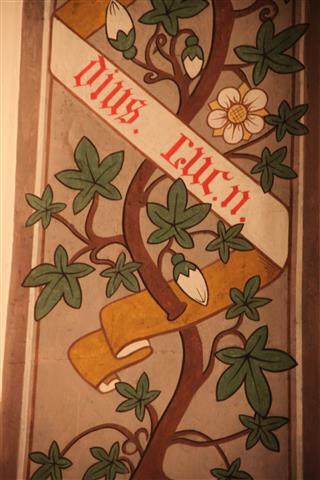 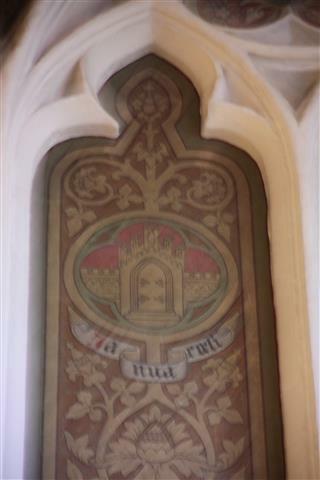 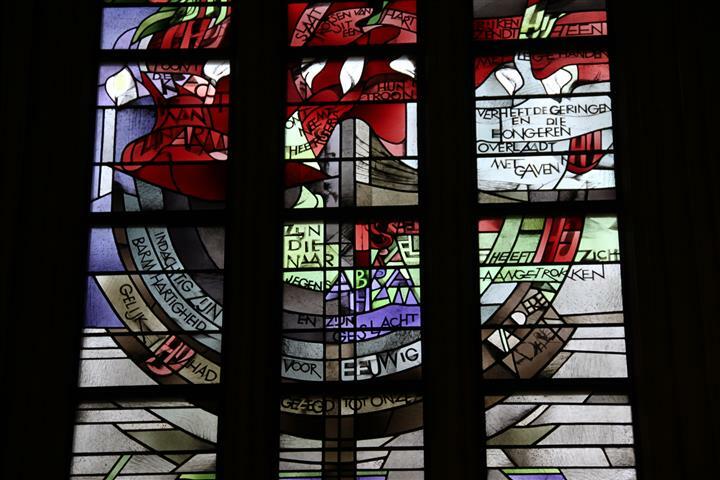 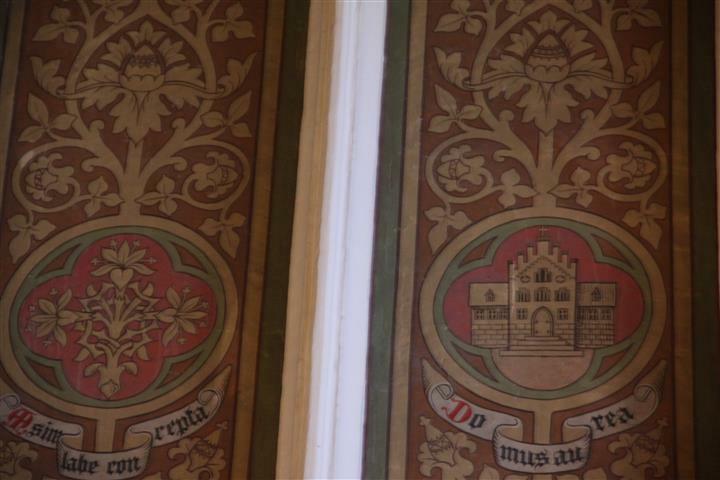 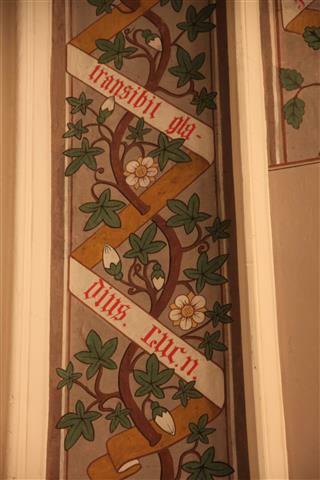 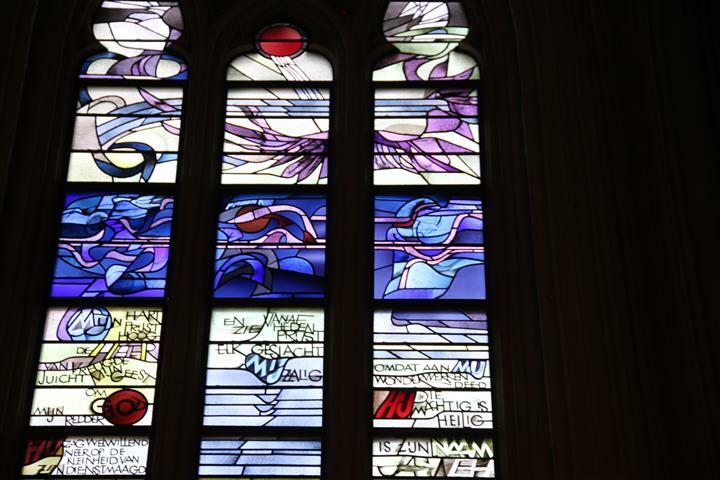 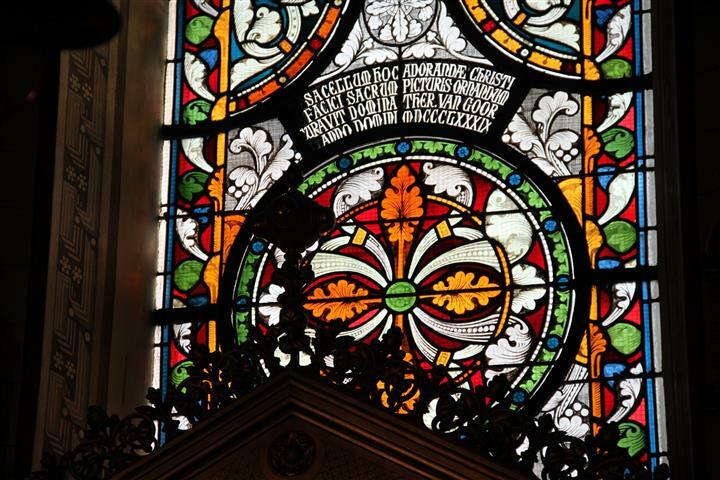 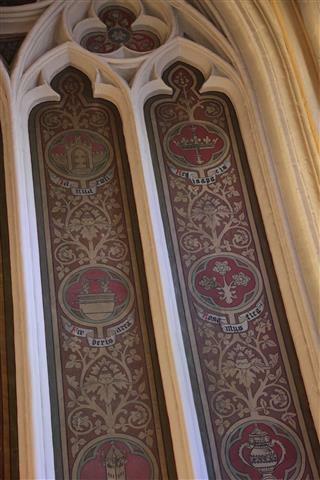 My second theory is that maybe the lettering here is something to do with memorials to the great and the good connected to the Basilica of Saint Servatius and that space has been left to extend the Tree of Life painting in the future in some way. 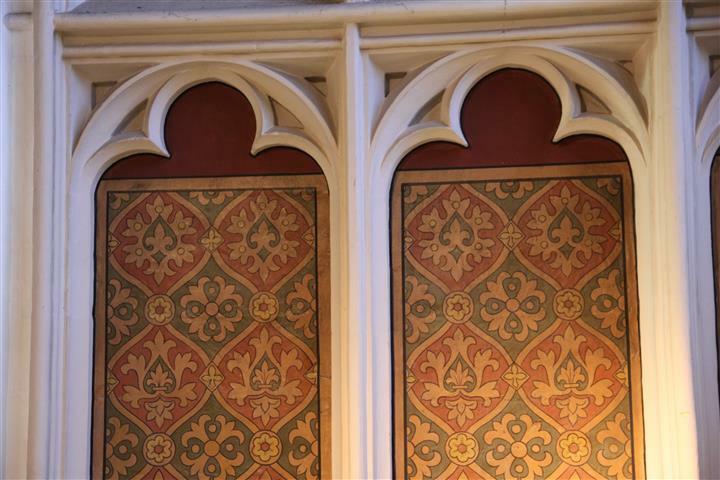 It’s a strange mix of looking both a finished and unfinished piece at the same time, but the detail remains and I love it. 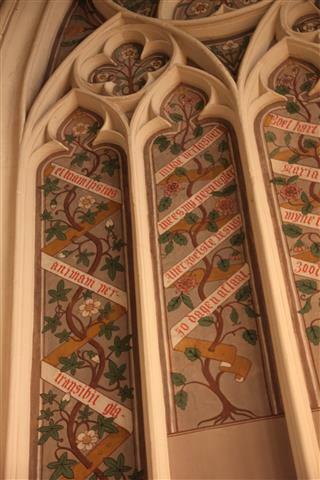 I took a lot of photographs so that in the close up’s I might find a way to read the text one day in the future and possibly shed some light onto why this painting looks the way that it does.